The archaeological excavation of the Western Han Tomb of the Marquis of Haihun in Nanchang, carried out from 2011 to 2015, contributes greatly to the study of Western Han archaeology, history, and material culture. 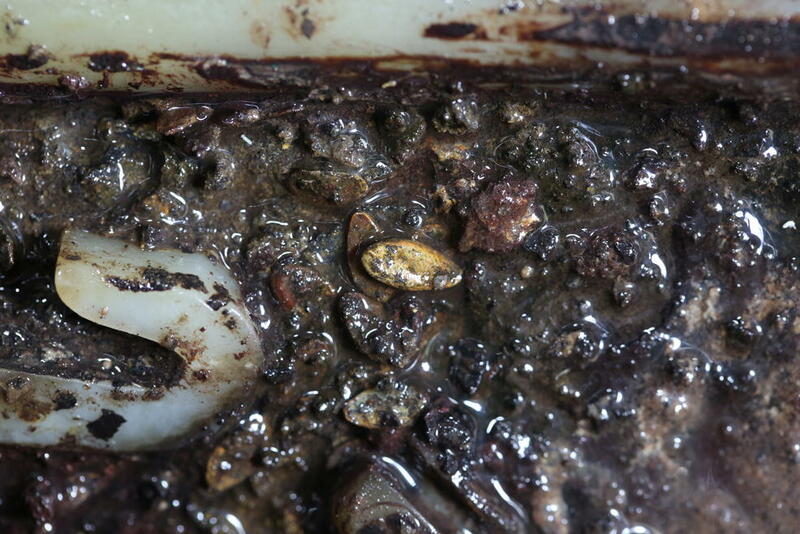 This paper is an introduction and initial discussion of the results of the excavation. 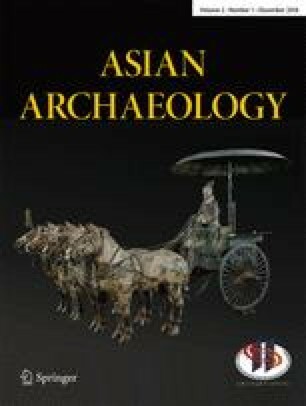 The paper consists of four major parts: the first part introduces the advanced “first-class excavation, first-class conservation, and first-class exhibition” and the theoretical framework of the excavation and its execution; the second part provides an overview of the tomb of the Marquis of Haihun, the cemetery, and relevant sites in the surrounding areas within the larger scope of Han Dynasty archaeology; the third part includes an introduction and preliminary analysis of the excavated objects, in particular the bamboo slips and wooden tablets, musical instruments, chariots and chariot fittings, bronze artifacts, gold artifacts, jade artifacts, and lacquer pieces; and the fourth part, based on historical records, discusses the archaeological findings in light of the Marquis of Haihun’s personal experience and the historical background of his time. On March 23, 2011, cultural relics authorities in Jiangxi Province received a report of the looting of an ancient tomb in Guodunshan 墎墩山 Mountain, located 500 m northeast from the Laoqiu 老裘 Village Sub-Group of Guanxi 观西 Village, Datangping 大塘坪 Town in the Xinjian 新建 District, of Nanchang 南昌 (Fig. 1). 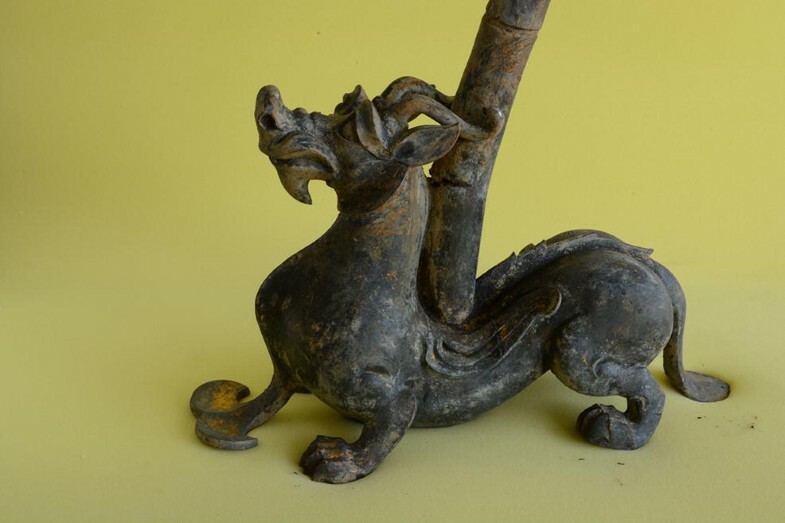 The Jiangxi Provincial Institute of Cultural Relics and Archaeology immediately sent archaeologists to the site and reported to the State Administration of Cultural Heritage 国家文物局 (SACH). Judging from the structure of the burial chamber revealed in the looters’ pit, the scale of the burial was monumental and had to be of high rank, so the tomb was recognized as very possibly related to the historical period of Liu He 刘贺, the King of Changyi 昌邑 (who was also called the Marquis of Haihun 海昏侯) of the Western Han Dynasty, who was known through historical records. 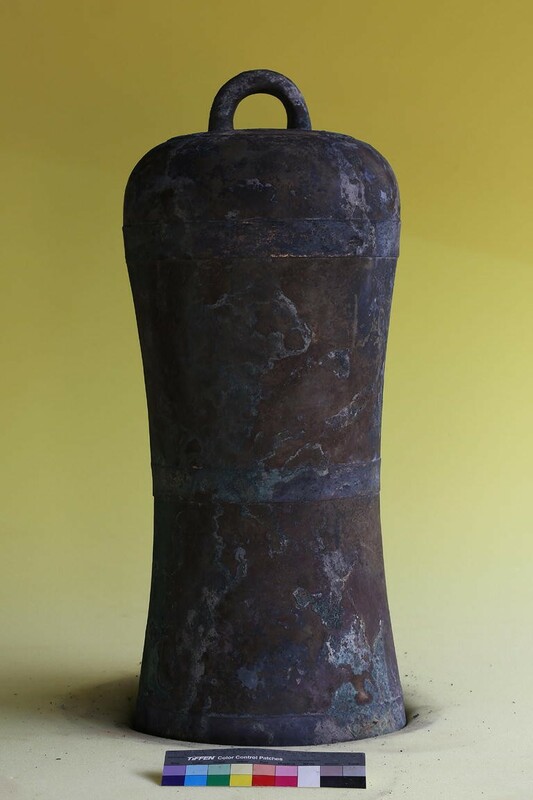 Because of the significance of the tomb, the uniqueness of its location, and the situation of it being looted and difficult to protect, the Jiangxi Provincial Institute of Cultural Relics and Archaeology filed an application to carry out rescue excavations. 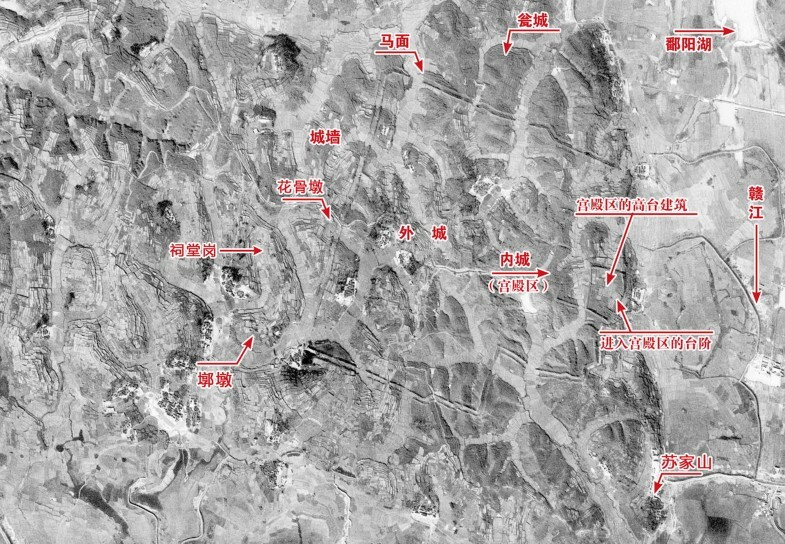 On April 6, SACH held an experts meeting in Nanchang regarding the protection of the tomb on Guodun Mountain, and after deliberation approved the excavation while also requiring a survey of the area surrounding the tomb. The Jiangxi Provincial Institute of Cultural Relics and Archaeology then established two plans for the rescue excavations, following the spirit of the official SACH evaluation and recommendation for the excavation project of the Guodun Tomb in Xinjian, Jiangxi. The first was the plan for the salvage excavation work at the tomb (江西新建墎墩墓葬抢救性考古发掘工作方案) and the second was the plan for the safety and protection of the excavation site (江西新建墎墩墓葬考古发掘工地安全保卫工作预案). 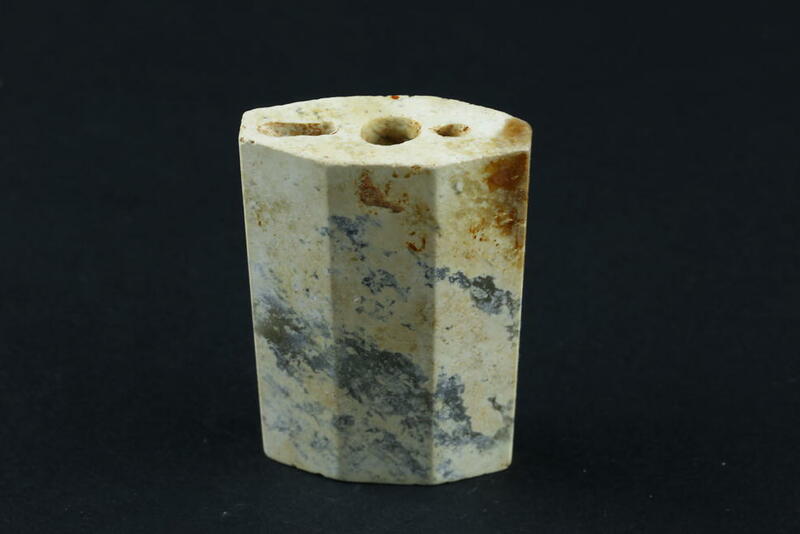 These established the technical approaches for the excavation of the Marquis of Haihun’s tomb, which commenced on April 15, 2011. 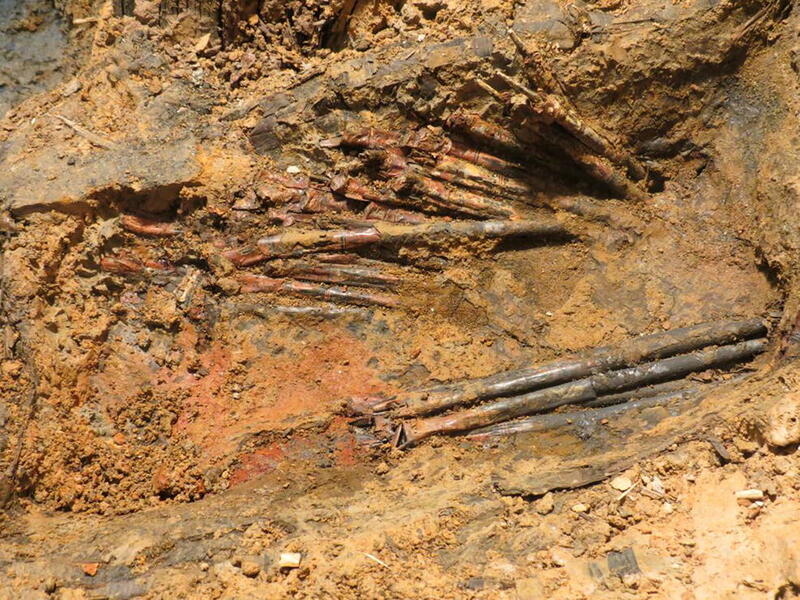 After six years, the archaeological work related to the tomb had surveyed almost 400 ha and excavated an area of 1 ha, achieving remarkable results. 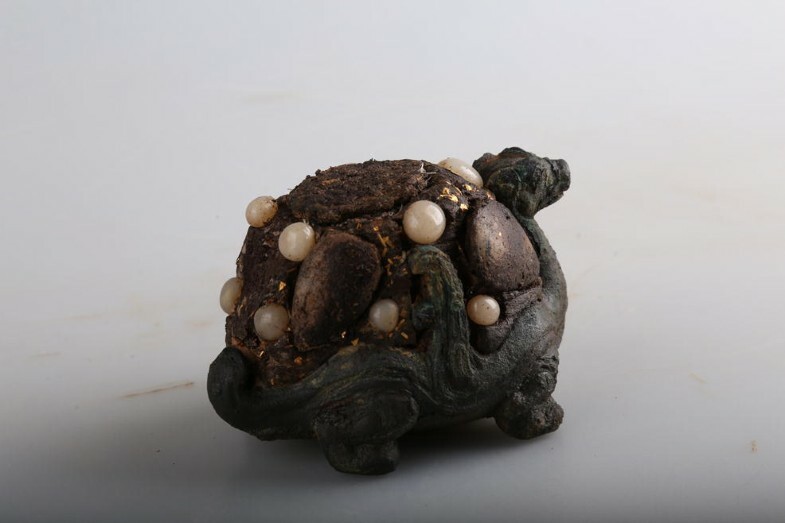 The Western Han tomb of the Marquis of Haihun, which had been sleeping for over two millennia, is now attracting great attention and opening up the study of the Haihun Principality 海昏侯国 of the Han Dynasty. 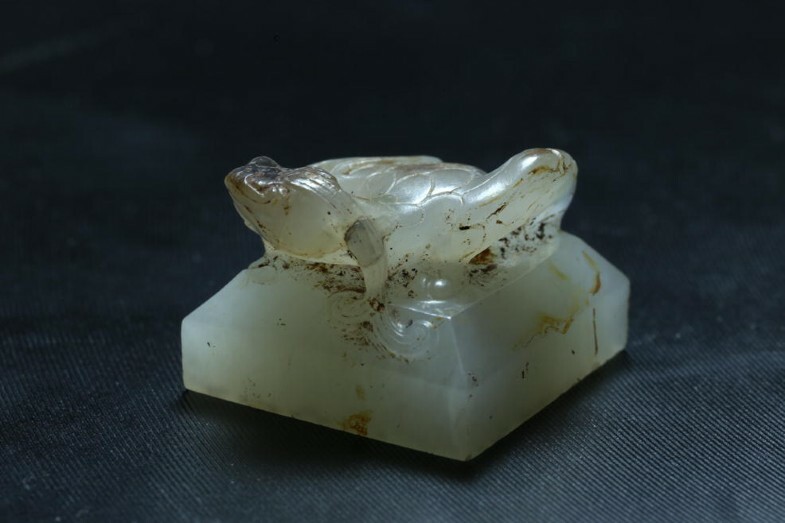 The excavation and protection of the Marquis of Haihun’s tomb received great attention from the PRC Ministry of Culture, SACH, and the local government. 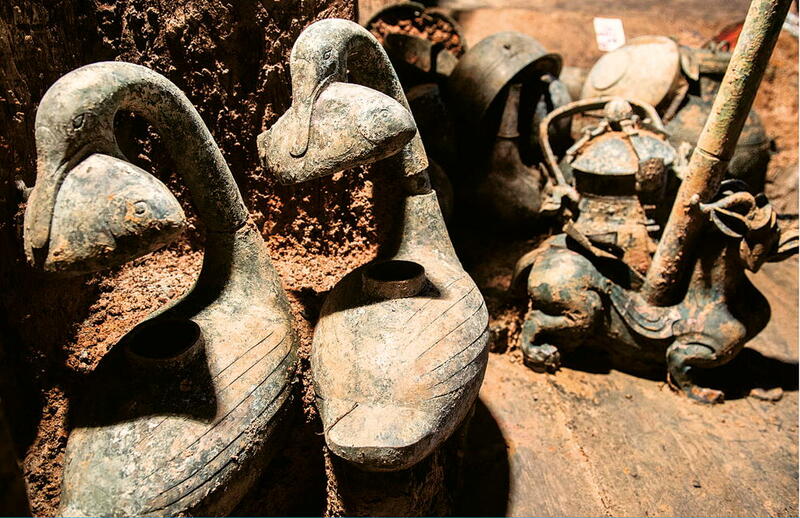 With the goal of featuring “the best excavation, the best protection, and the best exhibition,” the project was carried out following equivalent standards of a World Cultural Heritage application and also following PRC national field archaeological guidelines. 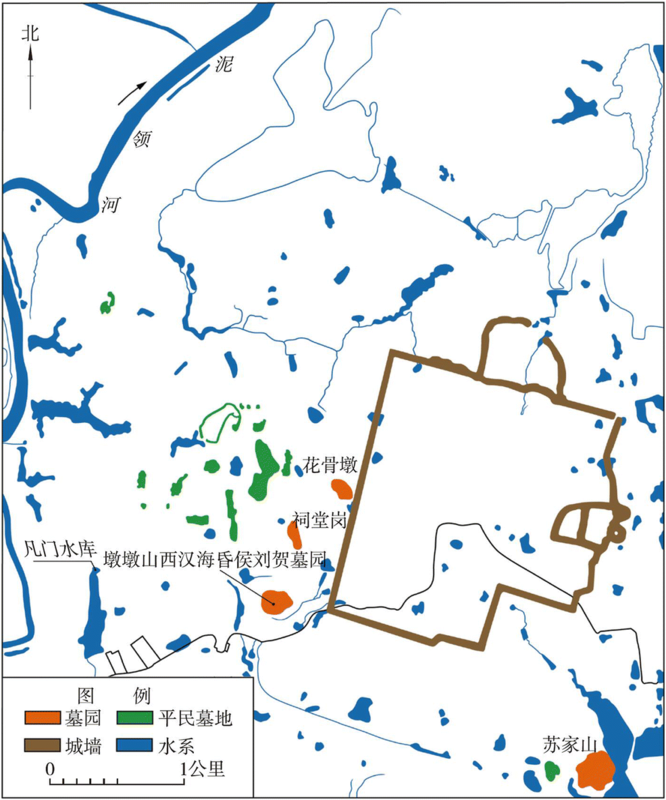 First, in the design of the project for the excavation of the tomb of the Marquis of Haihun, we employed the Chinese technical approach of “large site archaeology 大遗址考古,” with the project plan covering not only the tomb itself, but also the funerary park surrounding it, the greater tomb group it belongs to, and finally, the whole site of the capital of Haihun state, which contains the tomb group as well as the site of the Zijin City 紫金城. 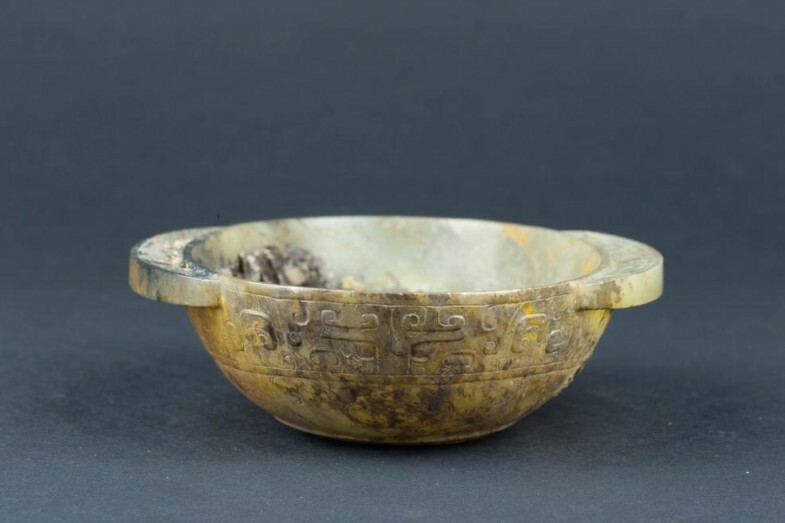 Following such an approach, the excavation work not only emphasized the tomb itself but also paid attention to the structure and elements of the tomb group and the relationship between the tombs and Zijin City, as well as the relationships between the tombs and surrounding cemeteries. 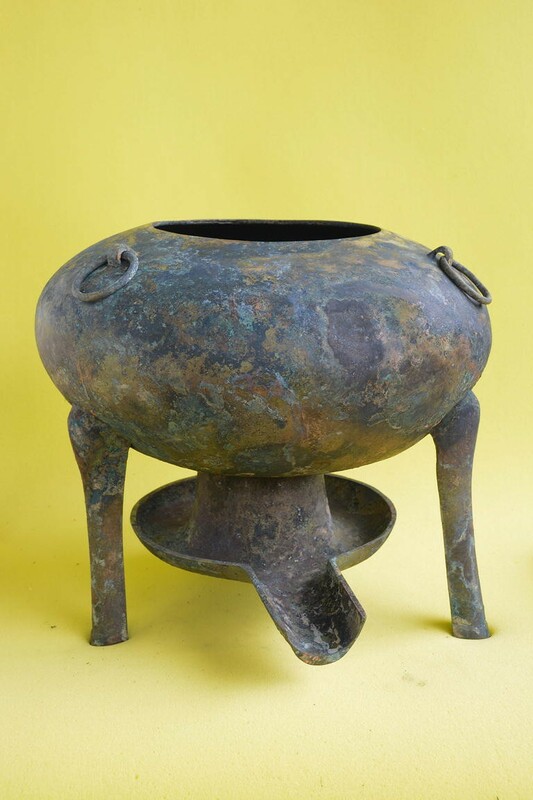 By doing so, the Marquis’s tomb could be connected to the site of Haihun Principality and provide clear directions for conducting future archaeological excavations of Haihun Principality. Prior to the 2011 salvage excavation, we carried out a thorough, systematic survey of a 5 km2 area surrounding the Marquis’s tomb and also cored the tomb and the funerary park. 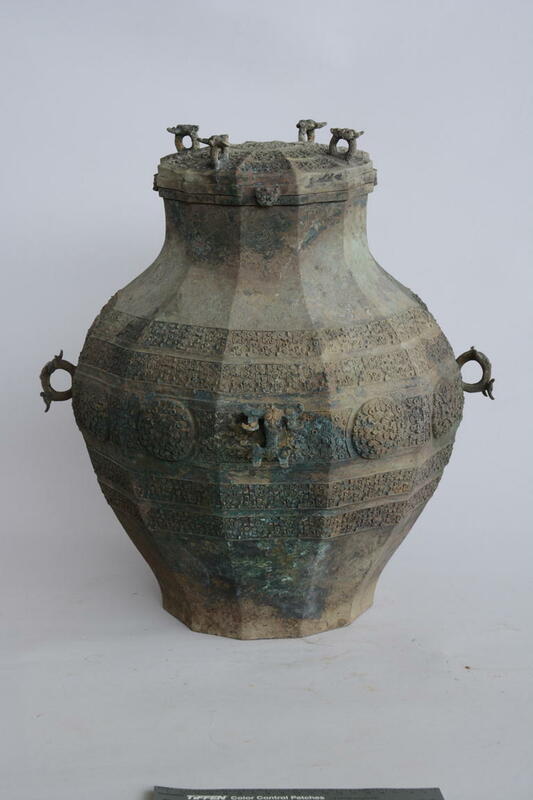 From 2012 to 2013, after installing surveillance and security facilities and implementing measures for safety and protection, which were preconditions for ensuring the security of the site during excavations and of the cultural relics, we started archaeological work on the tomb and funerary park of the Marquis of Haihun and their essential structure and basic and special characteristics. We carried out this archaeological work according to a plan, implementing it step by steps. 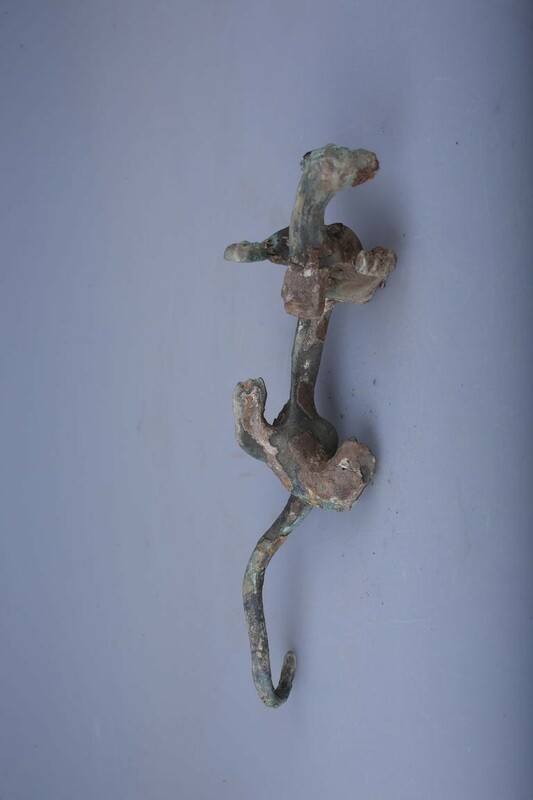 In order, we excavated one chariot pit and three affiliated tombs, and we analyzed the cross sections of two funerary park gates, their que 阙 gate towers, and the foundations of various buildings in the funerary park. 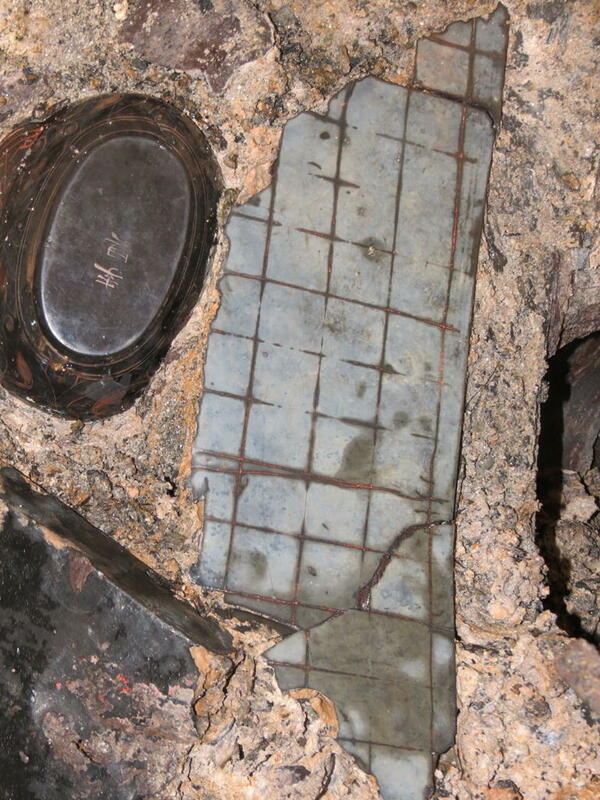 We also revealed drainage facilities and remains of roads (Fig. 2). In 2014, we began the excavations of the main tomb and completed the excavation of the mound and the fill of the tomb chamber. 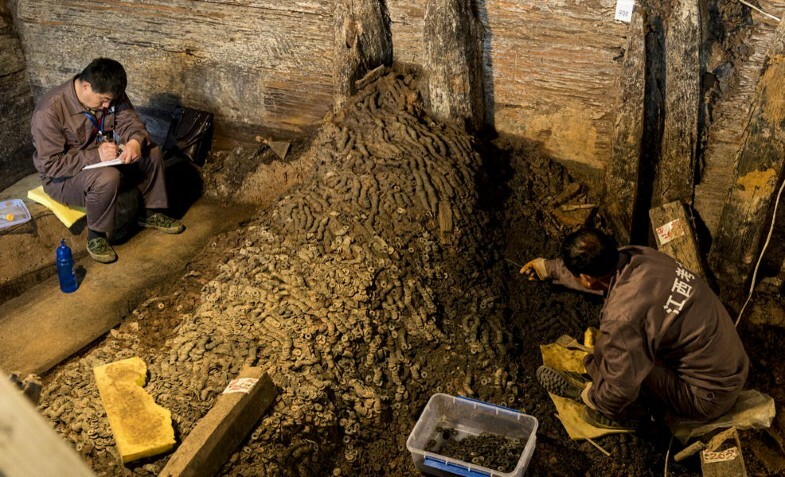 In 2015, we started to excavate, collect, and protect artifacts located in the chamber of the wooden outer coffin room. At the same time, we also started to core the surrounding group of enormous Han tombs. 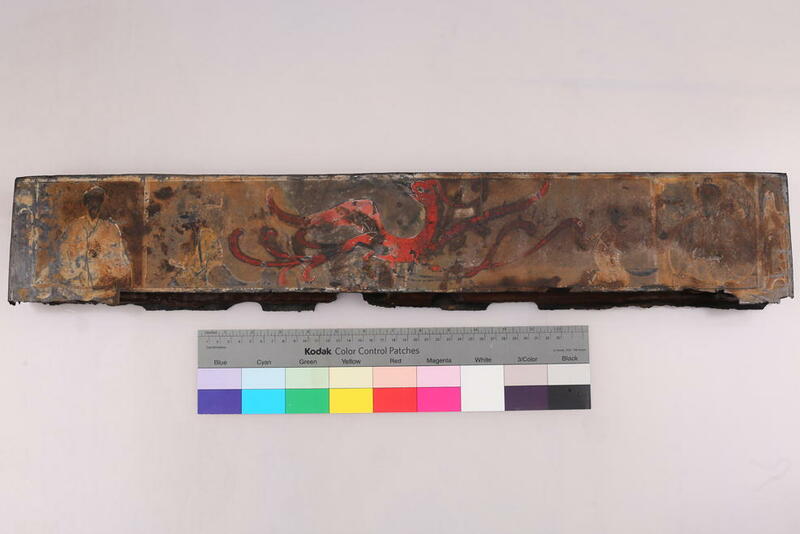 In 2016, we started archaeological laboratory work on the inner coffin of the main coffin, including launching our work on the cultural relics conservation and restoration of the bronze, jade, gold, and lacquer objects and bamboo manuscripts. 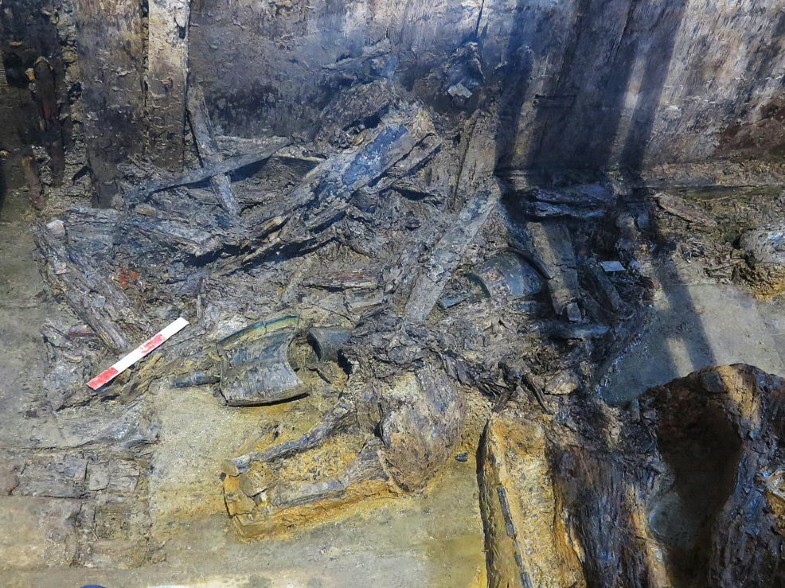 Also, we finished the task of disassembling, lifting, and moving the outer coffin chamber, the sectioning of the tomb’s bottom, and the excavation of the tomb ramp. 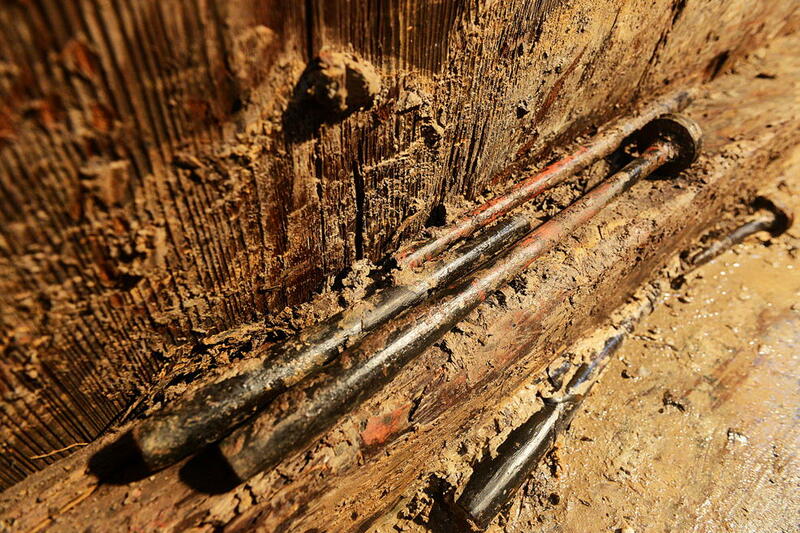 Meanwhile, we also carried out coring of the site of Zijin City. Secondly, during each stage of the excavations, each partner in the excavations had to first draw up detailed excavation and contingency plans which could then only be carried out after receiving official approval from SACH. At the same, each stage of the work also relied on predictions based on excavation experience and existing research on other Han Dynasty tombs of emperors, kings, and marquises and existing research, in order to assure the proper foresight, integrity, and academic nature of the work. For example, when excavating the two miniature carriages along the walkway of the main tomb ramp, archaeologists discovered utilitarian bronze chun yu 錞于“cowry-jar”-shaped vessels and a set of bronze nao 铙 bells. 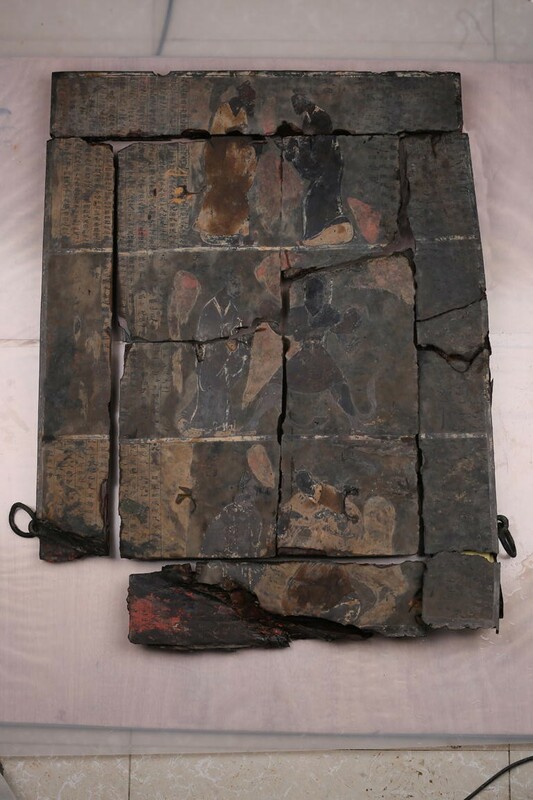 Based on Eastern Han stone pictorial reliefs (Luo 1961) and the Rites of Zhou 周礼 (Zhou 1999: 316; Jiangxi 2016a, 2016b; Xun 1988: 359), experts at the scene suggested that the chun yu and nao set should coexist with a drum. Following such a clue, with delicate work, the archaeologists in the end revealed remains of a wooden frame of a drum and well-preserved lacquered wooden drumsticks at the edge of the collapsed chamber boards near the entrance of the ramp (Fig. 3). 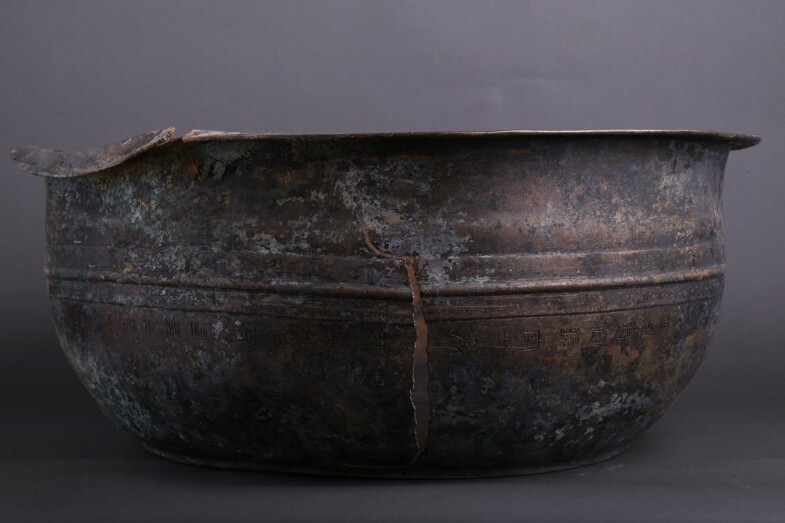 The discovery provides material evidence to the coexistence of the “metal-adorned carriage 金车” in The Book of Changes (Yi jing 易经) and “drum carriage 鼓车” used when marquises went on inspection tours in the Western Han, as recorded in received texts. 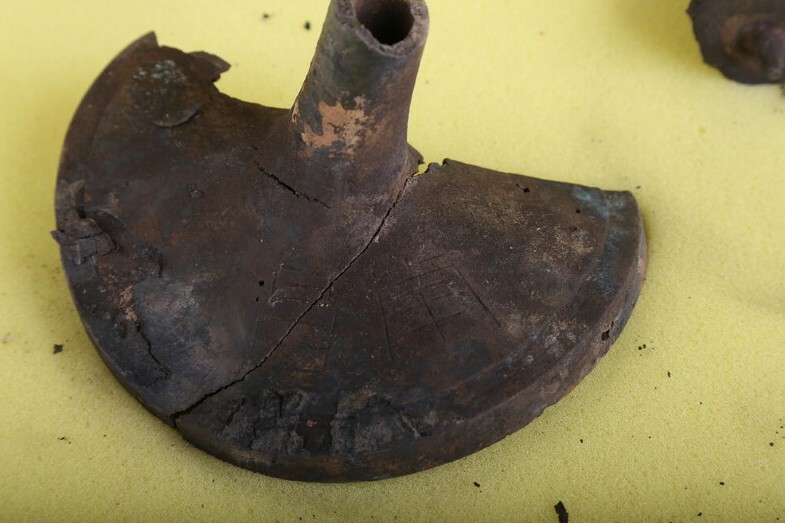 Third, based on the principle that “carefully and more carefully, assuring every object is absolutely safe,” the excavation prioritized the artifacts’ on-site protection. 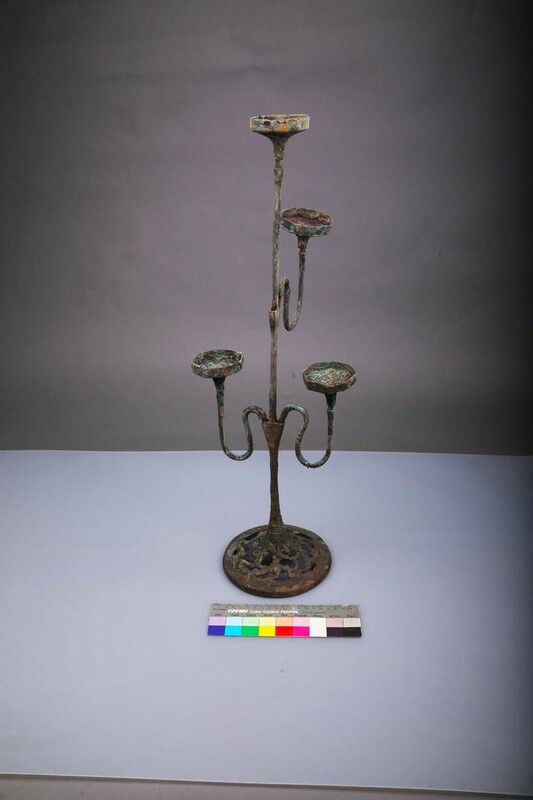 During the process of lifting artifacts from the archaeological matrix, archaeologists and conservators worked closely together in designing collection plans and in the collection and protection work. We broadly applied the technique of artifact block lifting and laboratory excavation, effectively protecting fragile artifacts and items that had complicatedly contexts. 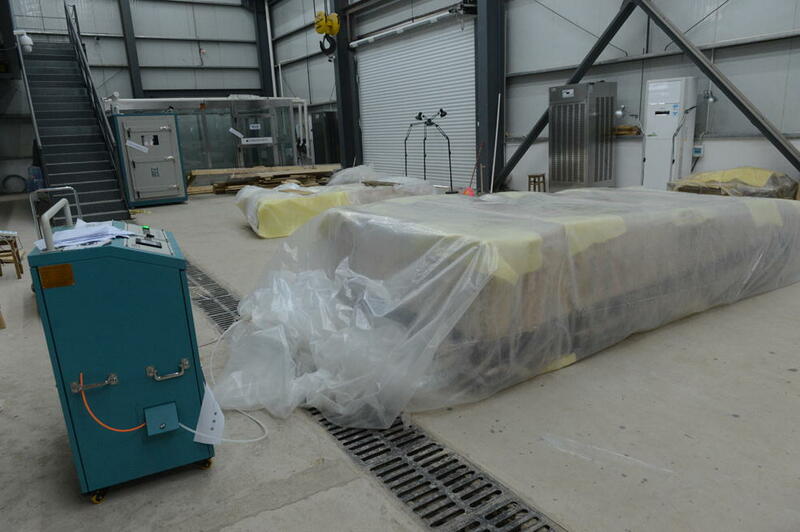 All items we collected went through damage-controlling protection in the emergency conservation facility before being sent to the relic conservation lab and to receive specialized protection. Fourth, this excavation was not simply one tasked only with uncovering the tomb, but rather, it was a project that had to thoroughly consider both excavation and future exhibition, as well as consider the protection of the whole site and thus create possibilities for applying for World Cultural Heritage Site status in the future. For example, the wall of the tomb pit was permanently preserved by a steel framework and netting so that no in-fill was needed after excavation: this allows future display and reuse, and thus helps in the World Cultural Heritage application (Fig. 4). 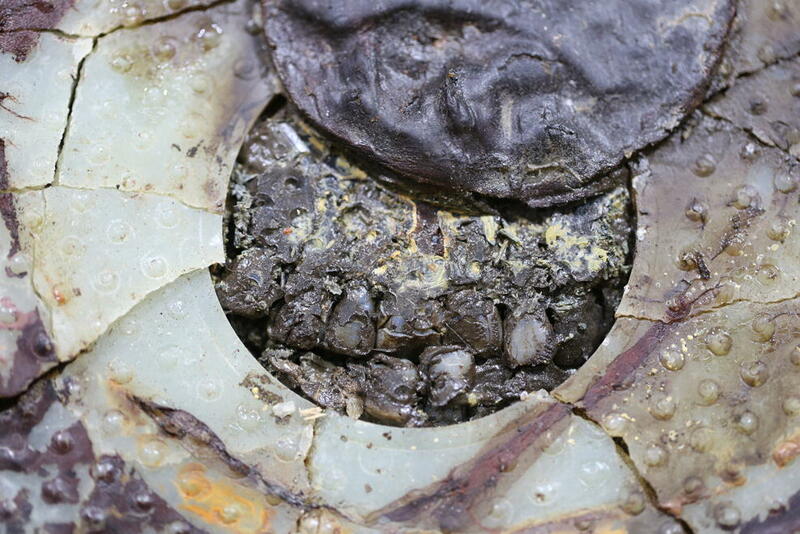 Likewise, we decided to pack and lift a two-ton set of coins with the clearest arrangement, the most ordered alignment, and the most well-preserved condition, from amongst the almost two million coins weighing more than ten tons yielded from the tomb (Fig. 5). We also managed to clear the two chariots discovered in the ramp by laboratory excavation. 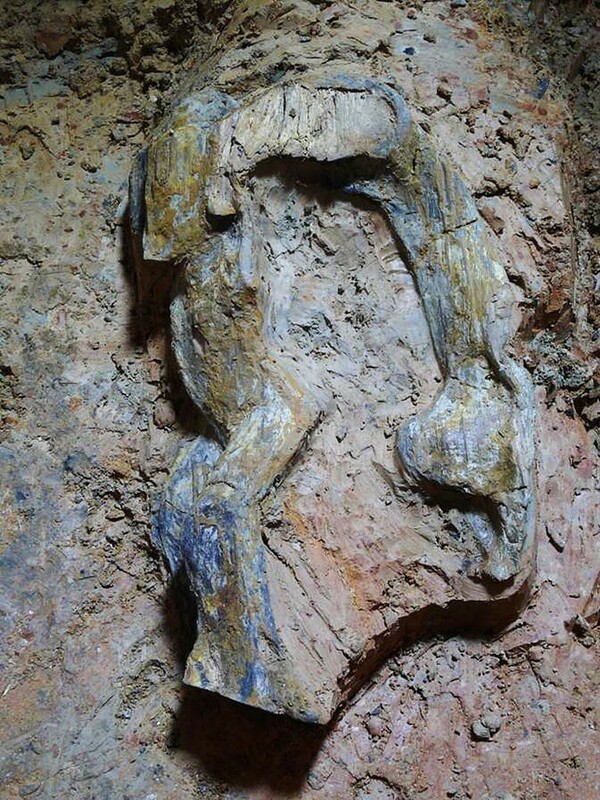 All of these efforts were on behalf of preserving remains in the best way for future exhibition (Fig. 6). We also launched large-scale coring in order to provide sufficient scientific information for the protection of the site and the construction of the heritage park. 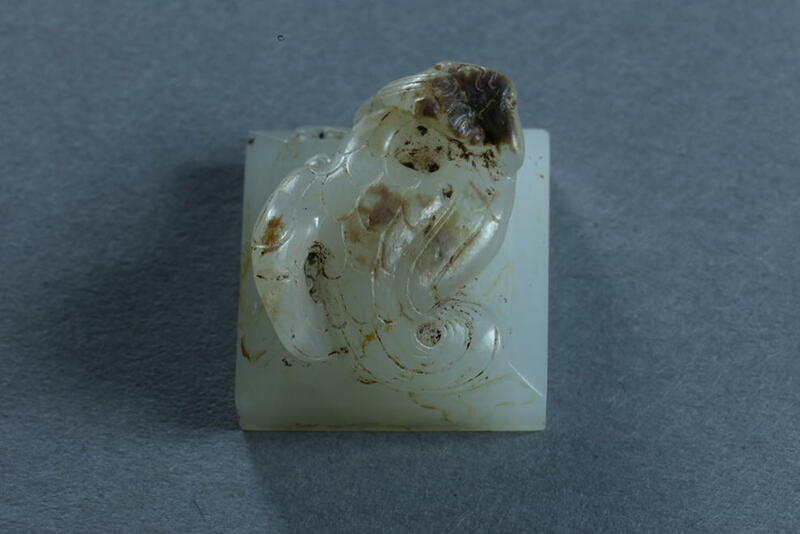 Fifth, following the instructions of the team of experts from SACH, the excavation involved experts from across China in every field, and especially ones from universities and science institutes. 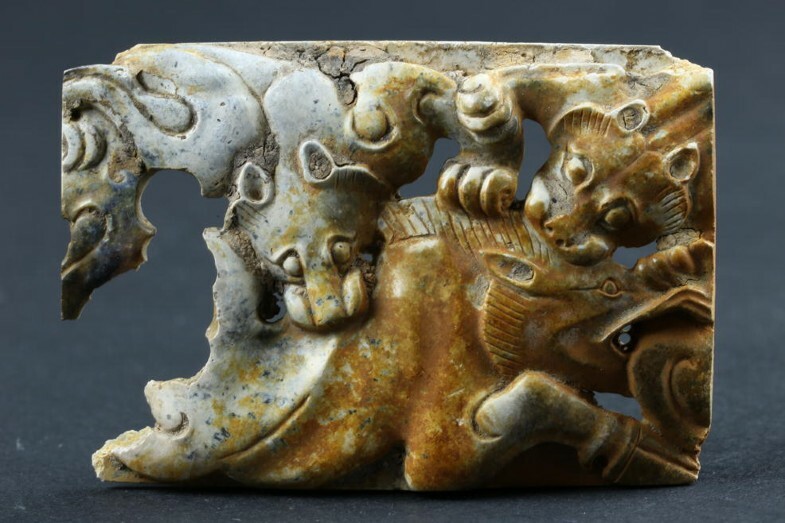 We also largely applied modern and innovative technologies in order to achieve the goals of detailed excavation, data visualization, and digitized information, and thereby guarantee the authority, regularity, and scientific accuracy of the excavations, conservation, research, and exhibits. 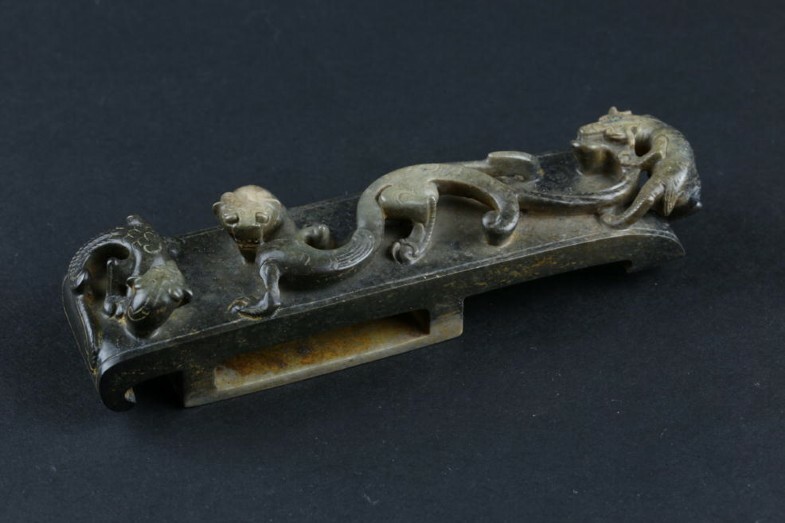 Scientific research institutes and universities, such as the Institute of Archaeology (Chinese Academy of Social Sciences), joined in the planning and the execution of the laboratory archaeology, paleoethnobotany, zooarchaeology, physical anthropology, and the protection of textiles, metal, jade, lacquer, and wooden objects, bamboo and wooden slips, and ceramics. 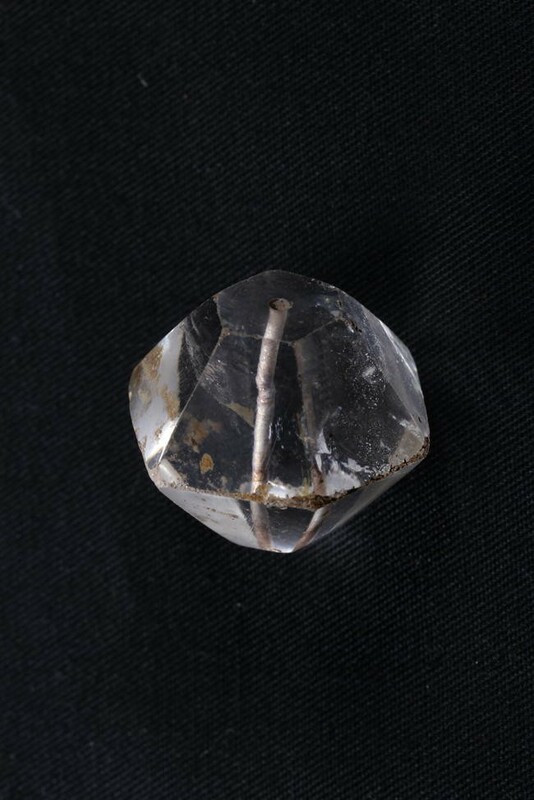 Such cooperation not only strengthened the on-site collection and protection but also expanded to the lab and thus provided results that cannot be achieved simply by field archaeology. Digital data collection and recording technologies included geophysical prospecting, GPS positioning, electronic total station surveying and mapping, GIS, aerial photography, 3D scanning, and time-lapse photography, as well as noninvasive and micro-invasive analysis and testing technology such as flaw detection, X-ray imaging, infrared scanning, hyperspectral imaging, and EDS were applied. 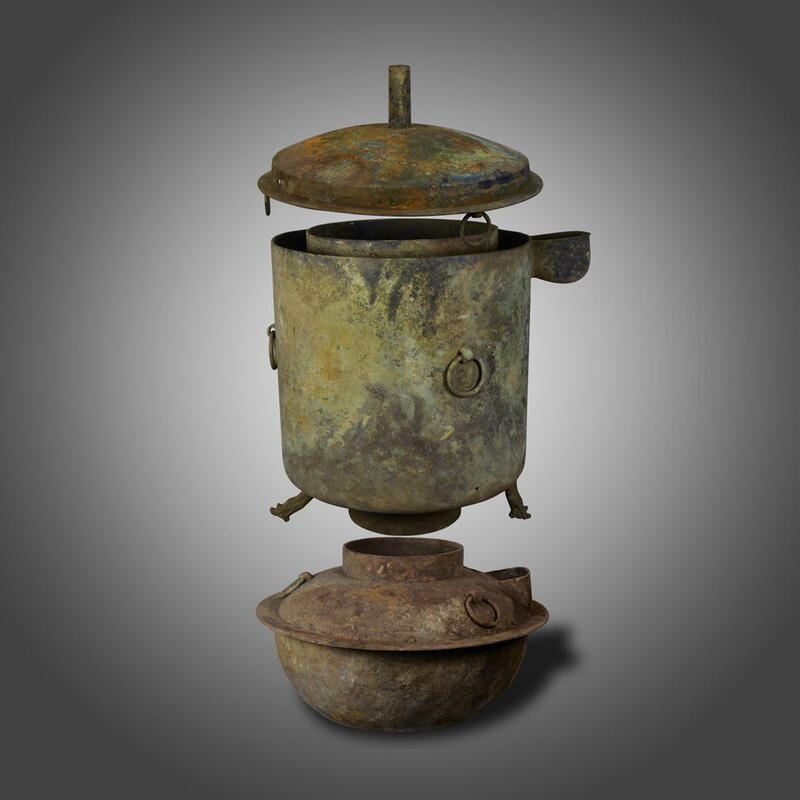 Relics collection and protection technologies included deionized water conservation, soil-separator, menthol, nitrogen-fill protection, and low oxygen storage. Protein, pollen, and DNA analyses were broadly applied, too. 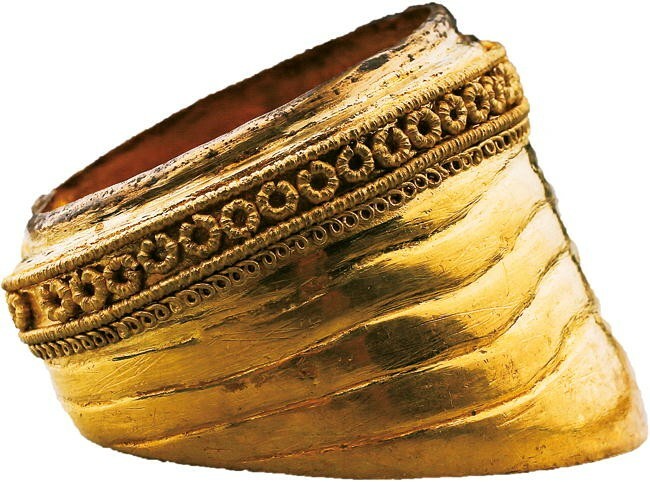 Such techniques were applied across the whole process of excavation and protection, for protecting relics and for extracting hidden data as much as possible. For example, we established a GIS grid survey to map the entire funerary park, deploying detection points every 2 m with transect lines spaced 5 m apart, gathering more than 9000 detection points. We could then use this to map every object in the funerary park using three-dimensional coordinate data. 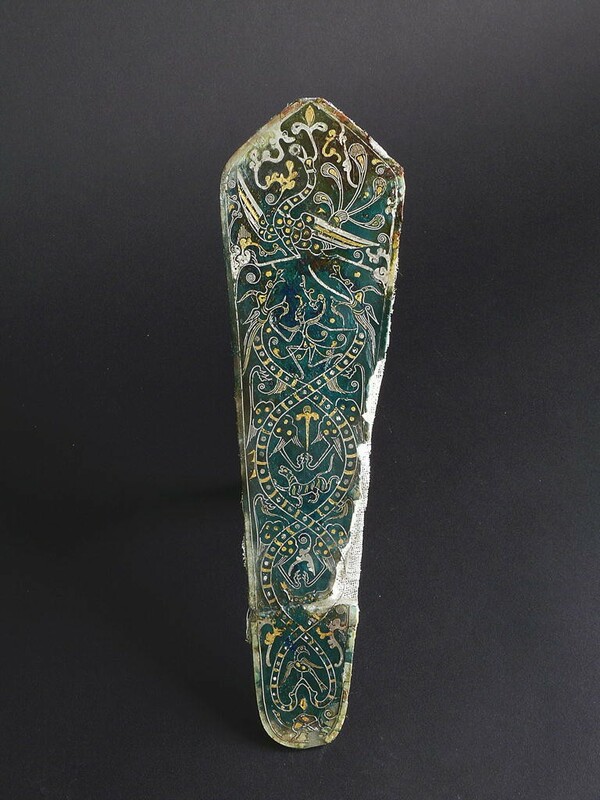 In another case, before opening the inner coffin, we applied X-ray imaging technique to understand the condition of the deceased and the remains. 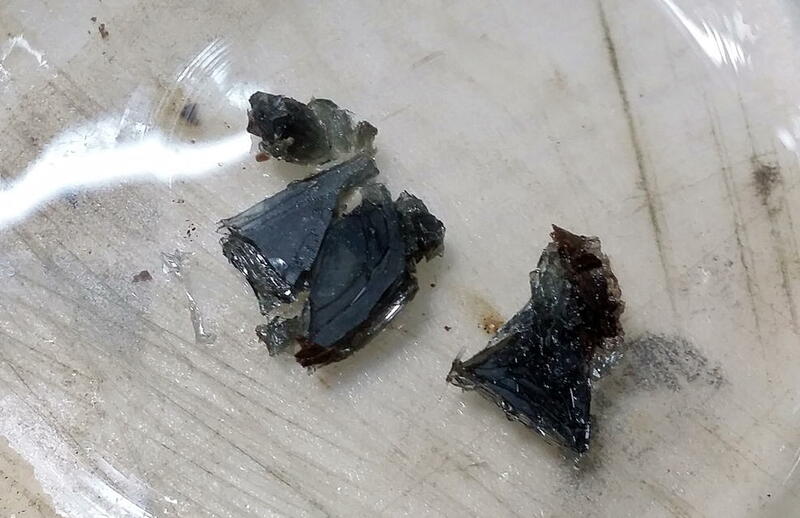 By EDS, we discovered that there was a lead-barium glass mat with gold-wrapped thread under the deceased and a set of iron chime stones in the north chamber, which was used in the tomb for musical instrument storage. With infrared scanning and hyperspectral imaging, we were able to obtain and record the writing on bamboo and wooden slips and on the dressing mirror with an image of Confucius and his disciples: these laid the foundation for future protection, deciphering, and study. 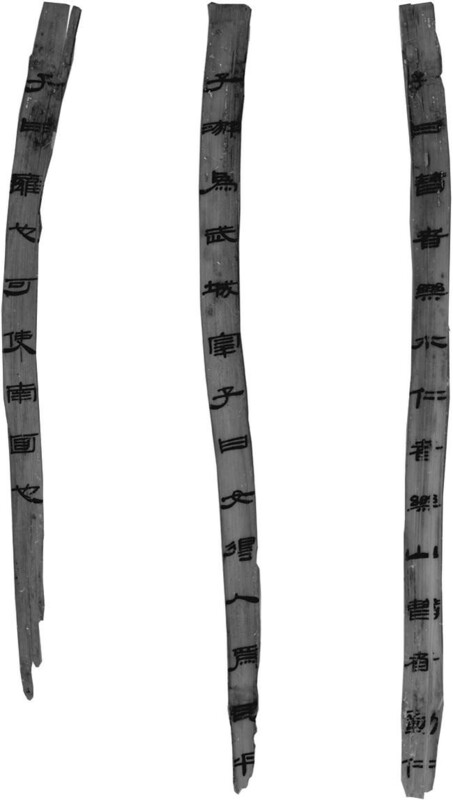 By infrared scanning technique we discovered the title of “Knowing the Way 知道” of the Analects and thus we suggested that the bamboo scripts of the Analects in the tomb are possibly the Analects of Qi, which has been missing for 1800 years. 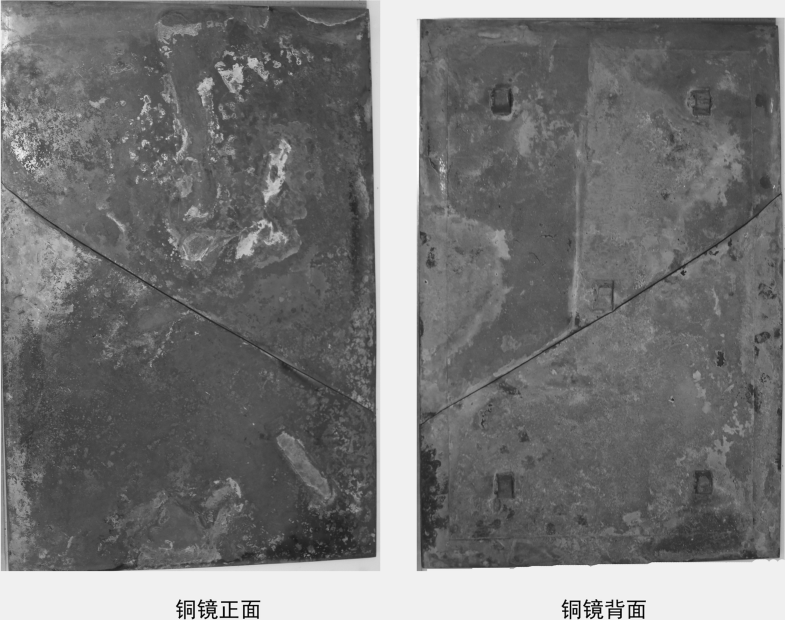 Hyperspectral imaging also helped us to obtain the earliest Confucius figure and the earliest King Father of the East image on the Confucius dressing mirror. 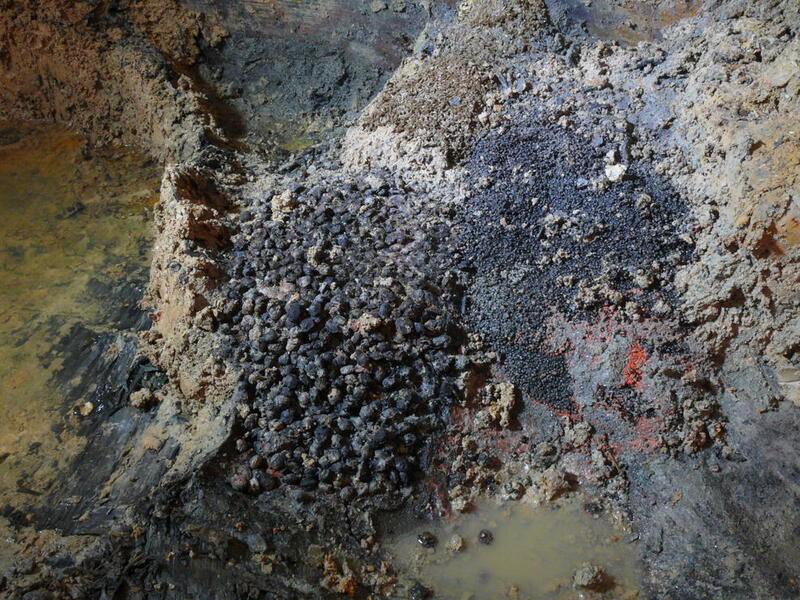 Nitrogen-fill protection and low oxygen system refers to a system in which excavations are carried out under a covering in which there is a non-oxygen or low-oxygen environment that impedes oxidization of organic objects, including a body or fabrics, when they are exposed to the air in excavation. To do this, the archaeologists must wear oxygen masks while working. 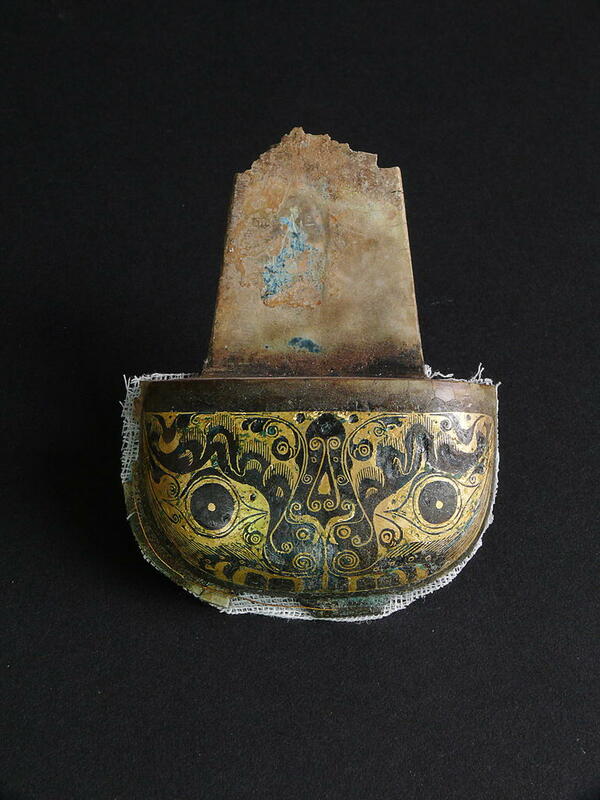 This was the first time in the history of Chinese archaeology that this aerospace technology was incorporated and it also was a new experiment in relic preservation (Fig. 7). In another example, we processed the remains of plants and leaves obtained by flotation and discovered that cedar and maple were the major plants of the funerary park. 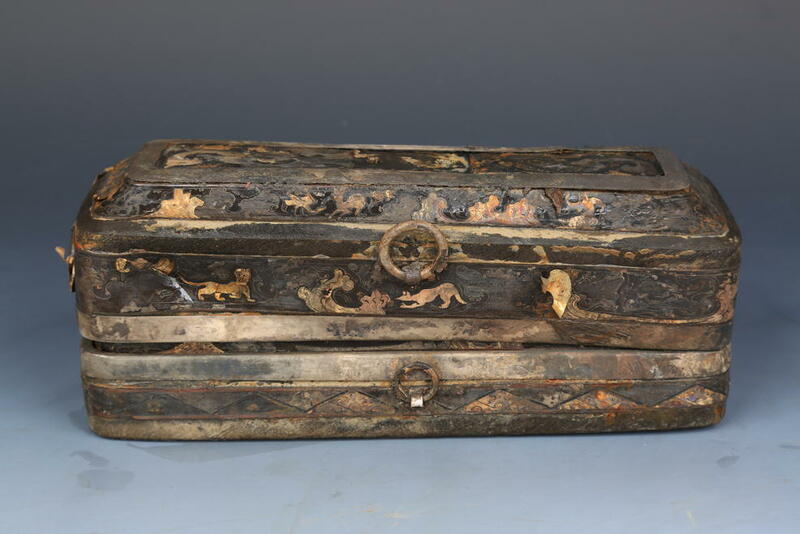 The materials of the wooden outer coffin chamber consist mainly of pine, camphor, and Japanese cedar, and the main coffin was made of camphor wood. 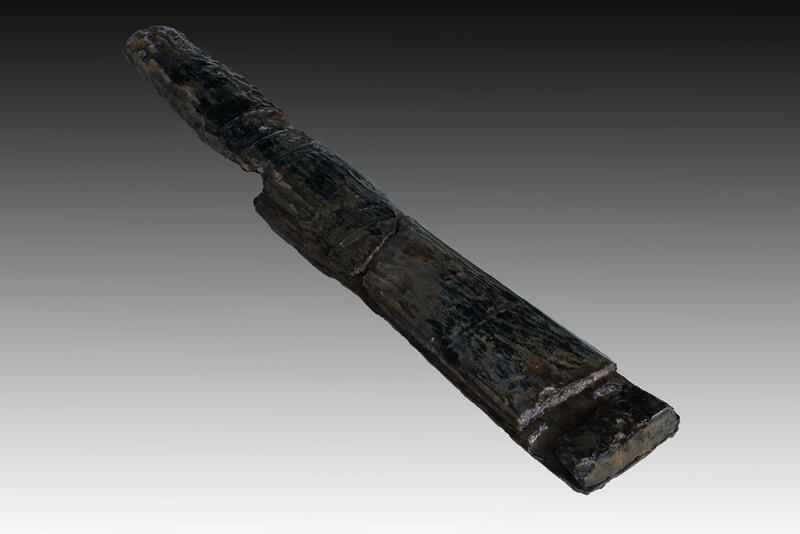 In the west room of the main chamber we discovered pine-soot inkstick, and in the food storage in the north storage we found broomcorn and foxtail millet, rice, and hemp (Fig. 8). We also identified residues of taro in steaming vessels found in a wine making storage compartment in the western storage chamber. 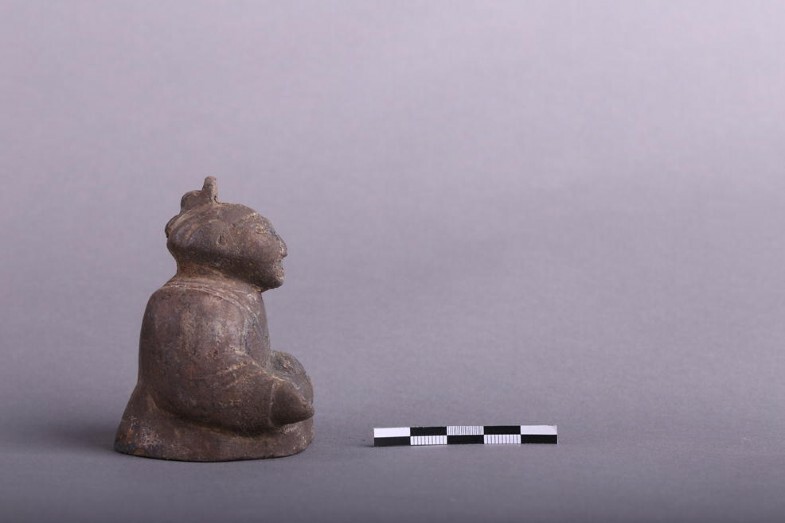 Our survey of the 5 km2 area surrounding the tomb led to the discovery of a series of important remains including the site of Zijin City, the tombs of several Marquises of Haihun, and cemeteries of aristocrats and commoners. 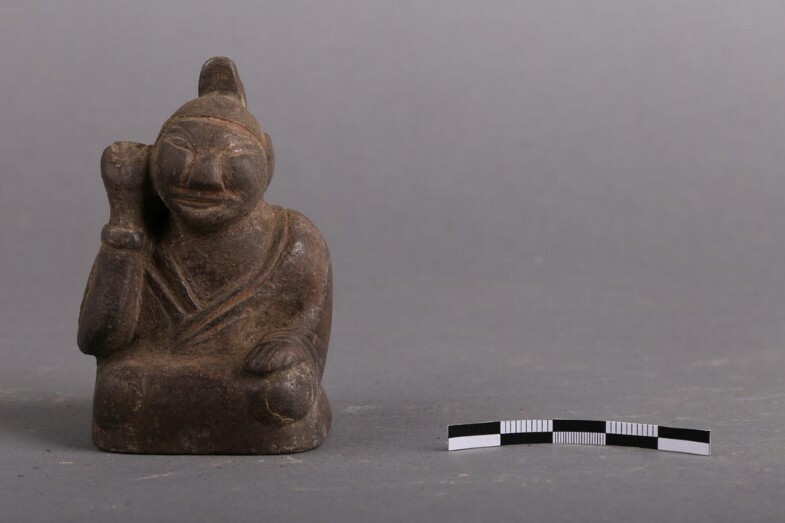 The received texts assure us that the 3.6 km2 city site we located was Zijin City, the capital of the Haihun Principality during the Han Dynasty. These written records also basically allow us to confirm cemeteries to the west and the south of the capital are those of several generations of marquises, aristocrats and commoners (Han 1964: ch 13, 1717) (Fig. 9). 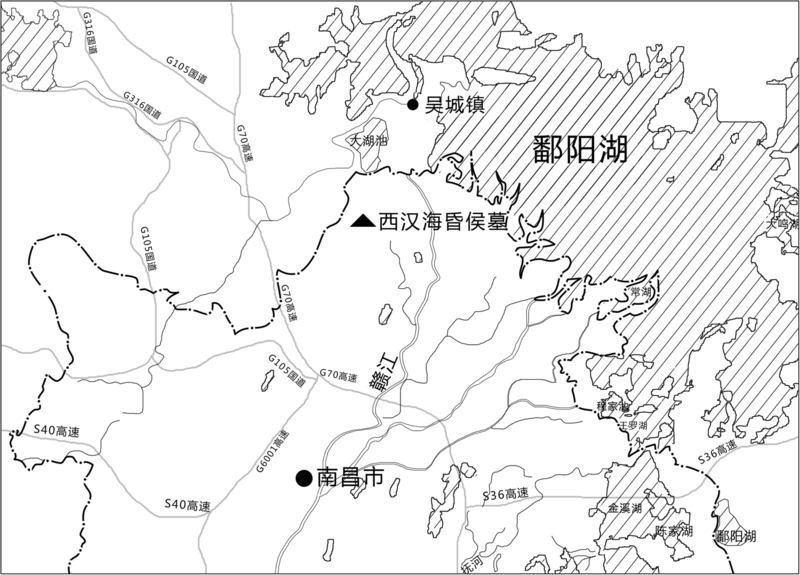 The Zijin City lies to the west of Gan River 赣江 and south of Poyang 鄱阳 Lake. It is L-shaped in plan and consisted of an inner and outer city wall. The walls overall are wholly preserved, completely made of rammed earth, and feature a double wall construction. The outer wall is 2037 m long, 1759 m wide, and covers an area of 3.6 km2. The width of the base is around 20 m and some parts are still preserved reaching 2 m in height. The distance between the double walls ranges from 7.2 to 28 m. There are five gates on the four sides of the wall (water gate included), and each gate has a gate pillar. A 200 m long two-way road passing between the city gates connected to the water channel network. We discovered large-sized rammed earth foundations at the points where the roadways connected to the water channels: perhaps these are the remains of piers. The water channels inside the city connected freely into the water-filled moat surrounding the city wall. This co-existence of water routes and roadways inside the city are the most special characteristic of the Zijin City. The inner city was located in the eastern area of the city and was a rectangular in plan, 438 m in length, 281 m in width, and had an area of ca. 12 ha. The inner city itself was comprised of two walled areas, east and west, connected by gateways. In the northwest corner of the eastern enclosure we located a 1000 m2 large scale building foundation, constructed with a foundation trench about 1 m in depth. The trench was filled with rammed earth on top of which were rows of round-shaped stone column bases set apart from each other: it is highly possibly indicating that this was the foundation was for the inner city palace. To date, within the city we have already revealed 4 roadways, 15 house constructions, 8 rammed earth foundations, 51 wells, 165 burials, and also ashpits, in all totaling over 200 such features (Fig. 10). 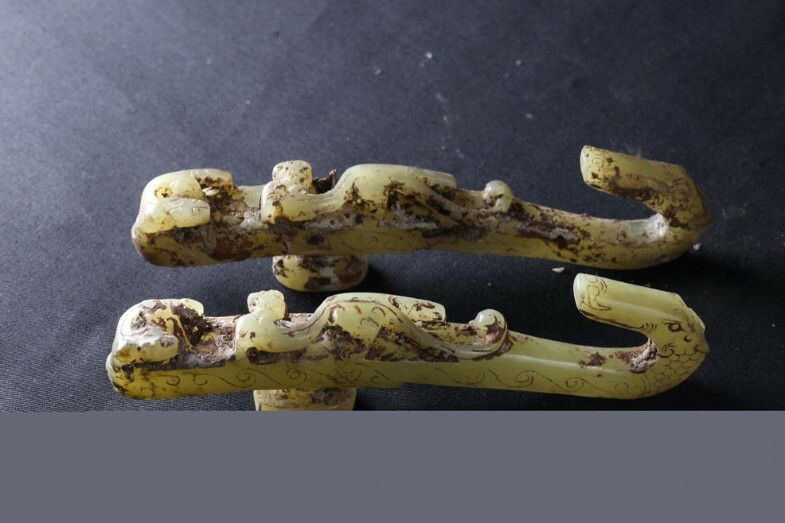 Preliminary results of coring in the cemetery areas show that the tombs of several generations of Marquises of Haihun were located at Huagudun 花骨墩, Citanggang 祠堂岗, Guodun 墎墩, and Sujiashan 苏家山. 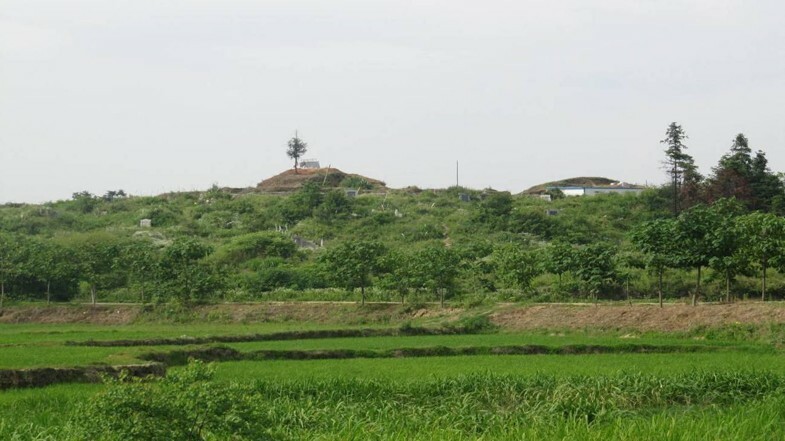 Surrounding this area, we also found 24 locations with tombs of nobility and numerous commoners’ cemeteries at Lingshang嶺上, Daijiaxibianshan戴家西邊山, Liujiagangxiabianshan 劉家崗下邊山, Jianfangshan 簡房山, Daijiashan 戴家山, Wufangshan 五房山, Longkeng 龍坑, Gouluandi 狗卵地, Xianfashan 先發山, Jiaozishan 轎子山, Jiashangu 夾山谷, Beiniangshan 北娘山, Luxiadujia 爐下杜家, Taipanzi 台盤子, Yangjiashan 楊家山, Zoujiaguo 鄒家墎, Shuangguojia 雙墎岬, Dagushan 大鼓山, Kejiashan 柯家山, Shuaijiagang 帥家崗, Luochengshan 羅城山, Zhuzishan 竹子山, Guojiashan 郭家山, and Wanjiashan 萬家山. The cemeteries cover an area of about 1.4 km2 in total. The funerary park of the Marquis of Haihun is trapezoidal in plan with the tombs of the Marquis and his wife lying at the center. It has a wall foundation and wall, which are both rammed. The perimeter of the wall is 868 m, and it is about 2 m wide, covering 4.6 ha. We have discovered the east and the north gates. Each gate consists of a pathway, footing stones, and rammed foundation. The east gate is 5.7 m wide and 1.8 m deep, and the north gate is 10.6 to 12 m wide and 5.7 m deep. Outside the two gates are que towers, the platforms of which were of rammed earth construction and are situated symmetrically. 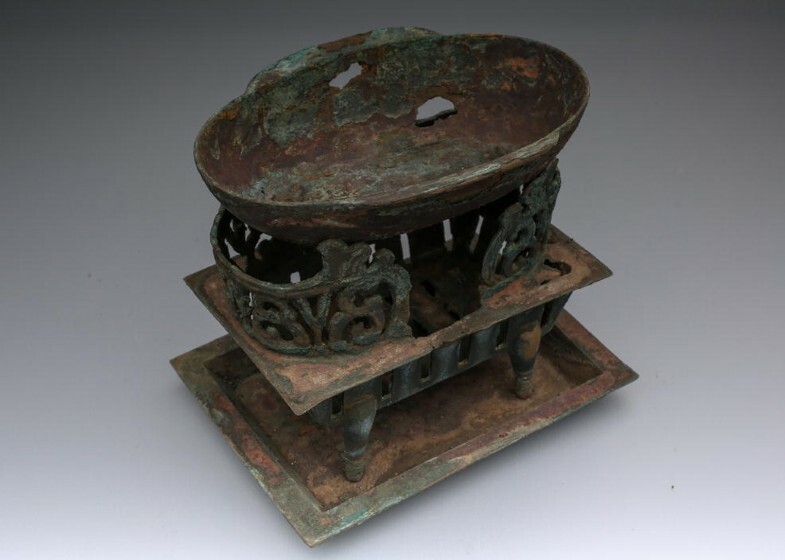 In the funerary park there are two main tombs, seven affiliated tombs (fu zang mu 祔葬墓), one chariot pit, and remains of roads and drainages (Fig. 11). At present we have two interpretations concerning the affiliated tombs: the first is that they belong to family members, and the second is that they belong to concubines of the Marquis (Figs. 12, 13 and 14). The tombs of the Marquis of Haihun and his wife lay side by side east and west of each other, occupying the highest position and the center of the funerary park (Fig. 15). 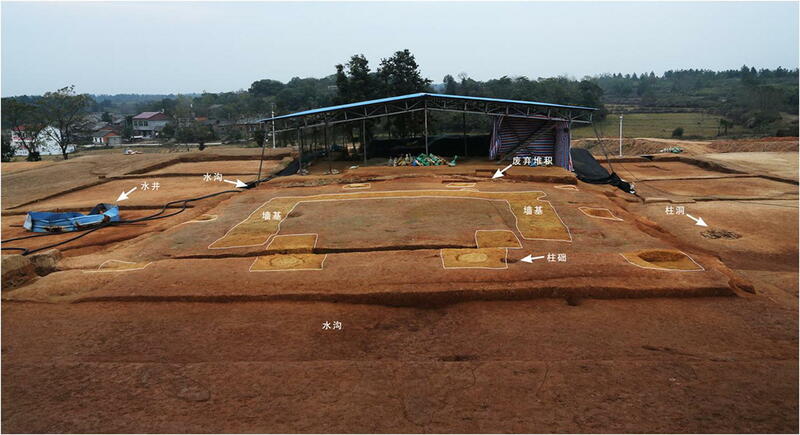 The two graves share a ritual platform complex, which is 100 m long, 40 m wide, and 4000 m2 in area and is comprised of an east compartment, a west compartment, a resting hall 寝, and an ancestral hall. The plan of the resting hall is square and has four L-shaped rammed foundations. The length of the sides of the resting hall is around 10 m so that it is 100 m2 in area (Fig. 16). The ancestral hall was a symmetrical, enclosed building complex with corridor; its main rammed foundation is U-shaped and surrounded by square rammed foundations, and in total measures 14 by 10 m with an area of 140 m2 (Fig. 17). Compartments on the west and the east side of the platform were both rectangular building complexes with enclosed corridors and four pillars in the front. The east complex is 27 m long, 10 m wide, and 270 m2 in area. 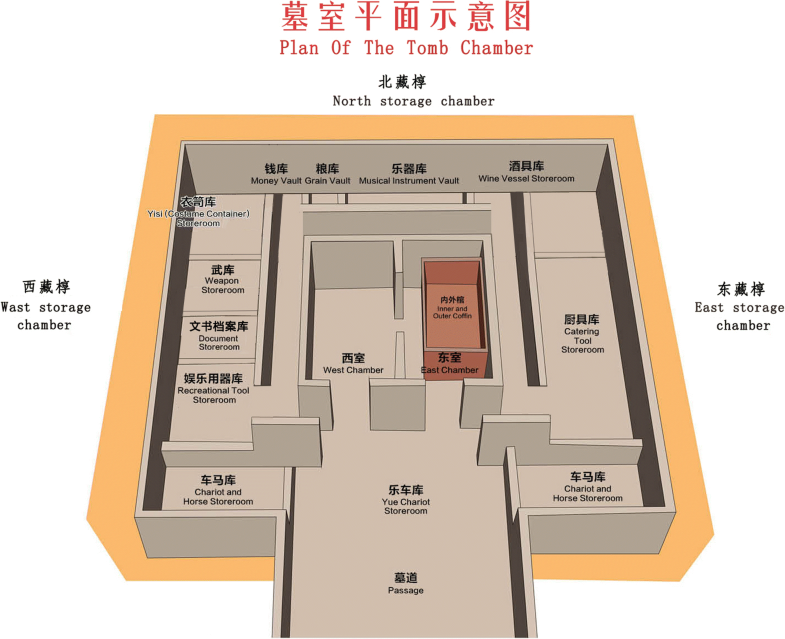 The burial of the Marquis of Haihun includes his tomb and a chariot pit on its west. The east part of the chariot pit was overlaid by the main tomb’s mound. 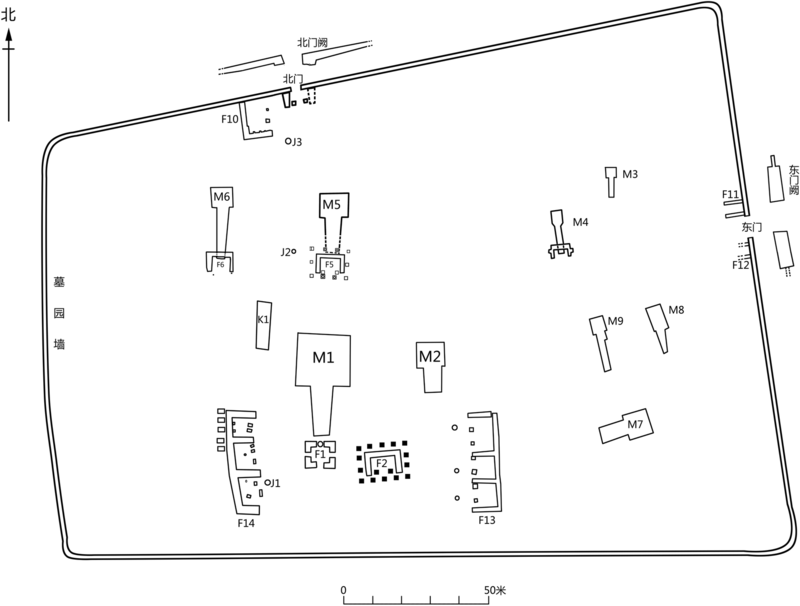 The plan of the chariot pit is rectangular, 17.7 m long from north to south, 4.24 m wide from east to west, and 2.5 m deep. 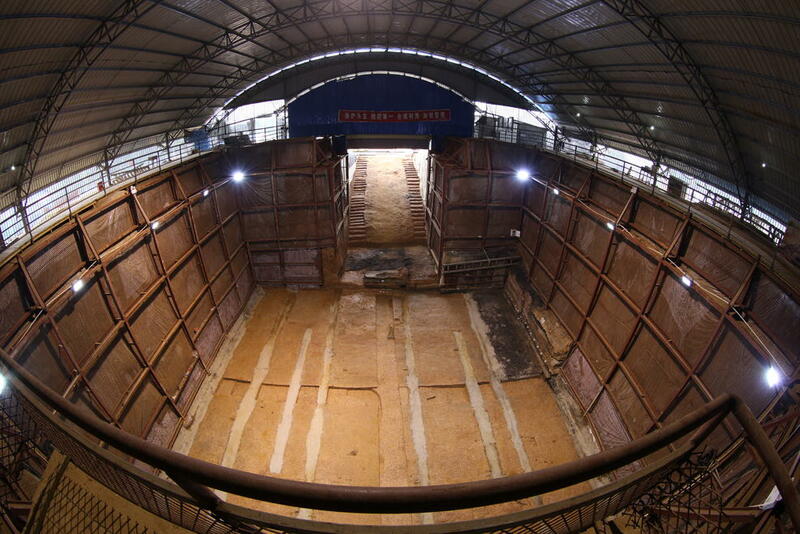 A ramp of 2.08 m in length and 2.18 m in width is located at the north edge of the pit but does not reach the bottom of the pit. The wooden chamber and supporting pillars are all decayed, leaving only traces. 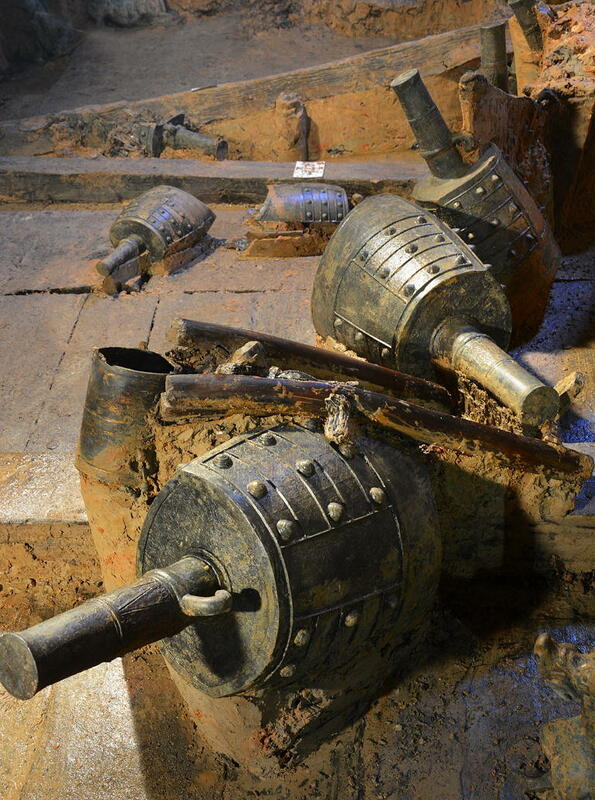 Judging from the height of the worked soil second-level platform (er ceng tai 二层台) and traces of the ceiling board of the chamber on top of it, the height of the pit is about 1 m. We uncovered five utilitarian high-ranking an che 安车 carriages and yao che 轺车 carts, along with about twenty horses (Fig. 18). The main tomb is grand in scale. On top of it stands a 7 m high pyramidal mound (Fig. 19), and the burial pit is in a T-shape facing the south, with a square wooden chamber 400 m2 in area inside (Fig. 20). 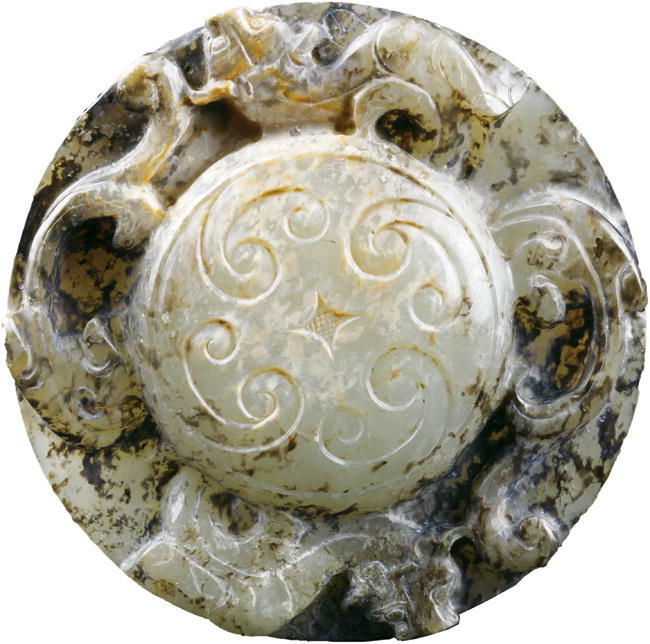 In general, the structure shows an inclination to mimic living quarters, thus indicating that it belongs to a middle or late Western Han marquis who was applying Western Han Dynasty burial practice rules (Han zhi汉制) in his tomb. First, the wooden outer coffin chamber was meticulously designed, with clear layout and functions. The chamber is divided into the main outer coffin compartment (guo shi椁室) at its center, with passage ways, storage compartments, corridors, and chariot storage (Fig. 21). 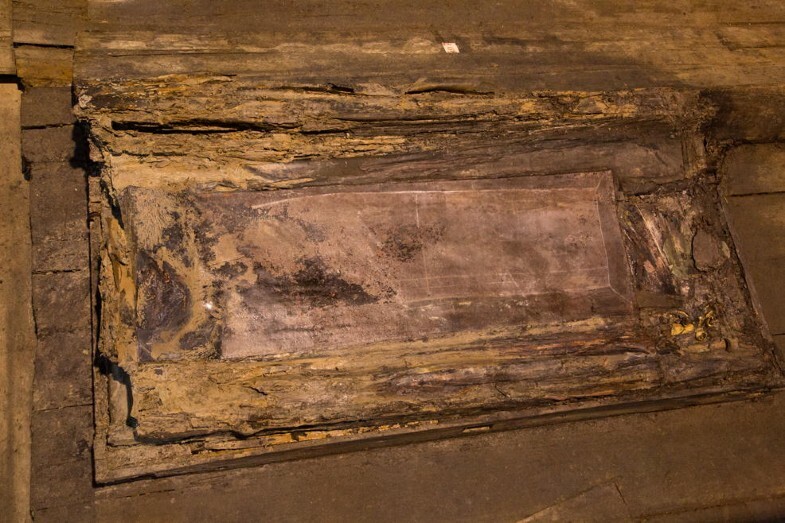 In the center of the wooden chamber is the main coffin compartment, which is 7.4 m long from east to west, 7 m wide from north to south, and about 3 m high (0.6 m higher than the surrounding storage areas), covering an area of 51.8 m2. 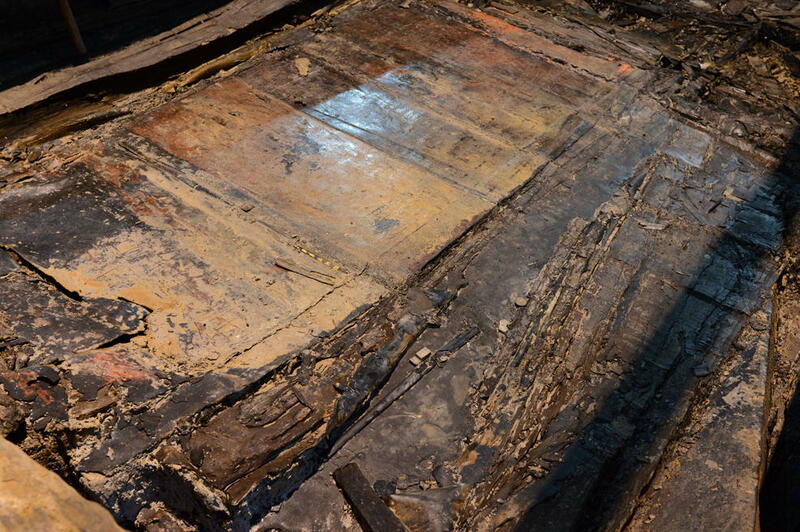 The main compartment of the outer coffin is then divided into east and the west rooms by wood plank walls, between which is a passageway. The width of the east room is about 3.7 m. There are windows on the east and the west side of the south wall and a door in the middle. The width of the west room is about 2.9 m. The south wall has a window on the west and a door on the east, which is about 1.4 m wide. 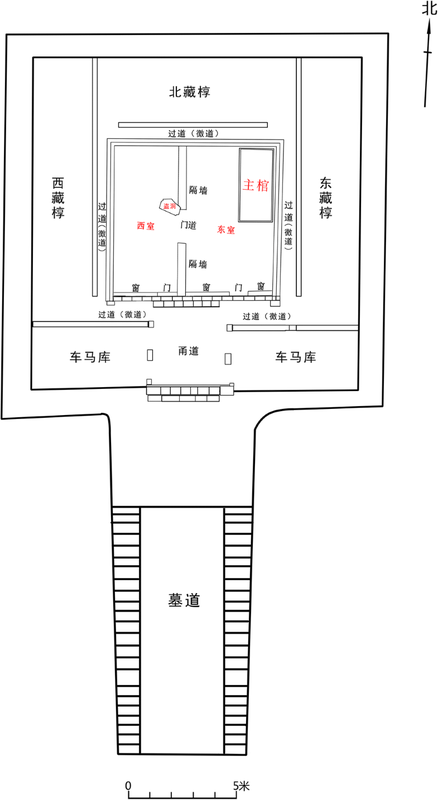 Preliminary analysis indicates that the east room is the resting hall (qin 寝) and the west chamber is the reception hall (tang 堂). The main compartment is surrounded on three sides, north, east, and west, with storage compartments with various functions. Between the main chamber and these storage compartments is a 7 m wide passage, and between the main chamber and the tomb ramp is a corridor. This corridor mainly served for the storage of music chariots, and on the east and the west side of the corridor are the storage areas for chariots and horses. Inside the north storage area, from west to east, are storage compartments for coins, grain, musical instruments, and wine vessels. In the west storage area, from north to south, lie storage compartments for cloth, weapons, documents, and objects for entertainments. 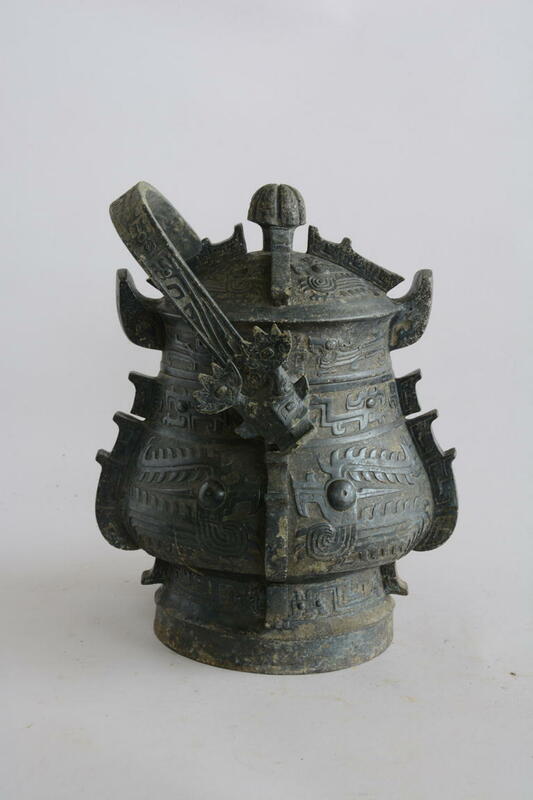 The east storage compartment is mainly for cooking wares used by the Officer of Foods (shi guan 食官) (Figs. 22 and 23). 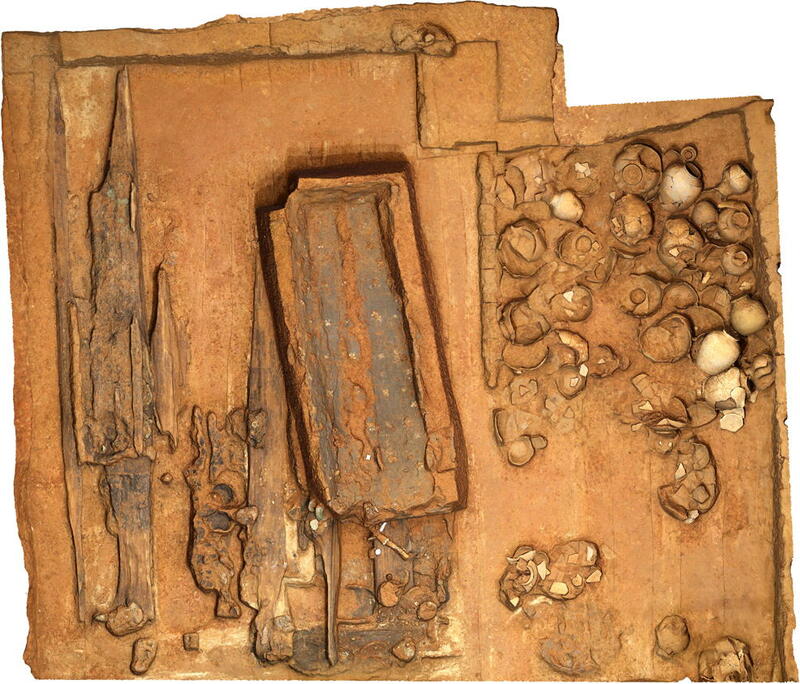 Second, the outer coffin chamber features a complex structure and was scientifically constructed. 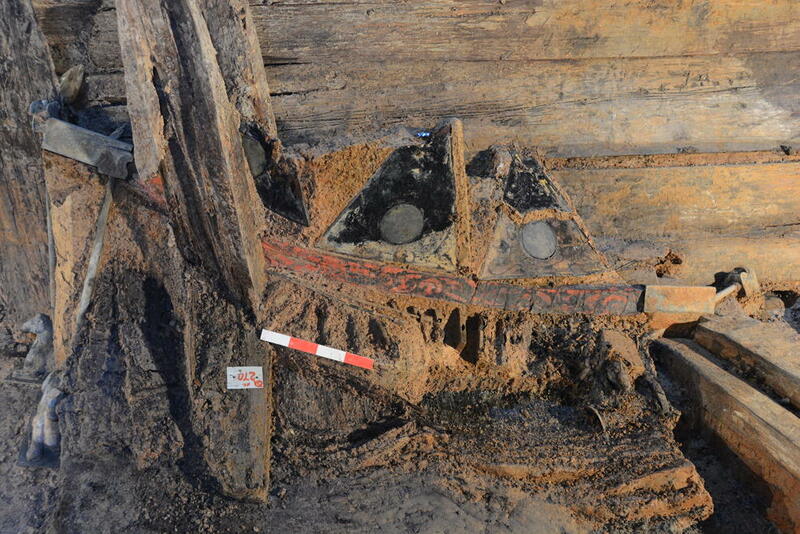 The bottom of the chamber was first leveled using sand, and then the base timbers were laid on top of this. 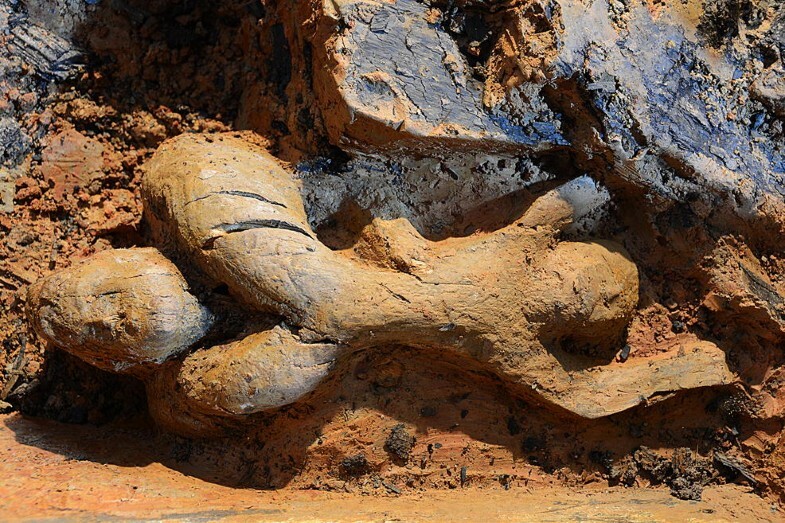 The base timbers and the spaces between them were padded and reinforced with sand, charcoal, and clay. On top of the base timbers were the floorboards of the outer coffin chamber, with the floor of the main chamber compartment having two layers, and the rest of the outer coffin floor having only one. A layer of bamboo or straw matting was lain across the floors. 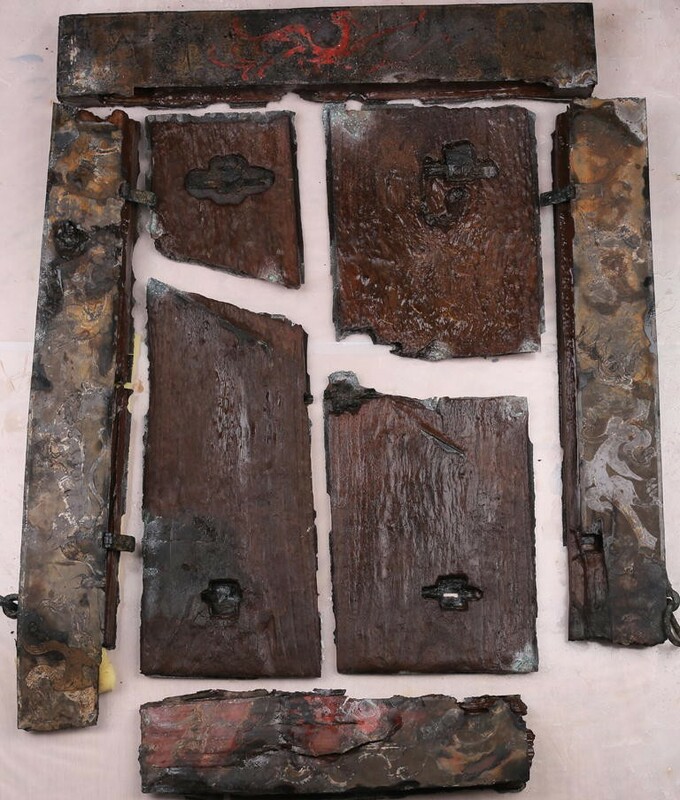 The floor boards and the boards of the sides, which were load-bearing, were all assembled using mortise and tenon joinery, with the side boards bolstered by wooden stakes. 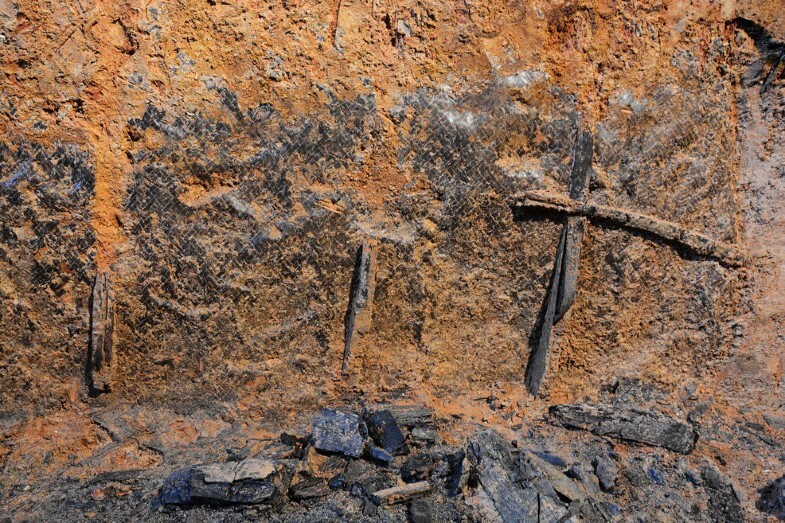 The er ceng tai between the side boards and the pit wall is 1.2 m wide, with rammed layers of sand, charcoal, and clay. Charcoal, sand, and white clay grouting, which are 0.7 m thick, were used to seal the ceiling boards of the wooden chamber. 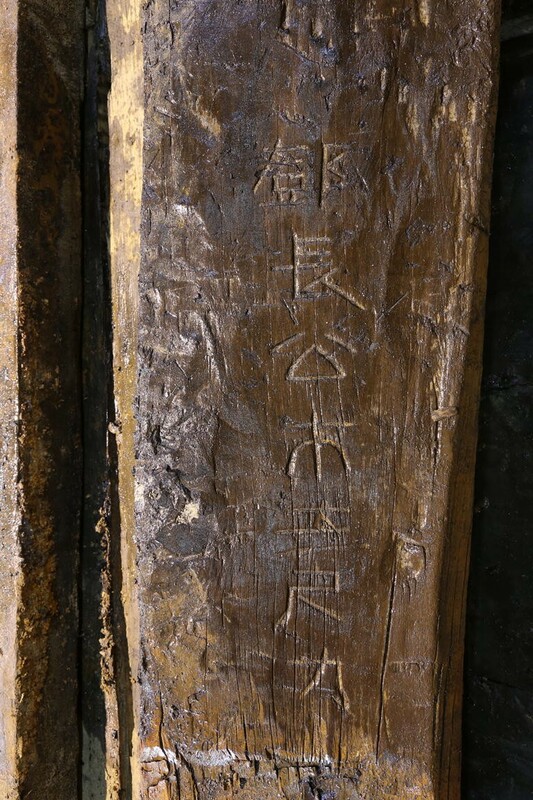 Some words and markings, such as the artisans’ names, numbers, and sizes, are incised on the boards of the wooden chamber (Fig. 24). The junction of the ramp and the wooden chamber has bamboo mats to cover the floor and the wall (Fig. 25). Third, the main coffin was placed in the northeast of the east room in the main chamber compartment. It is comprised of inner and outer coffins. 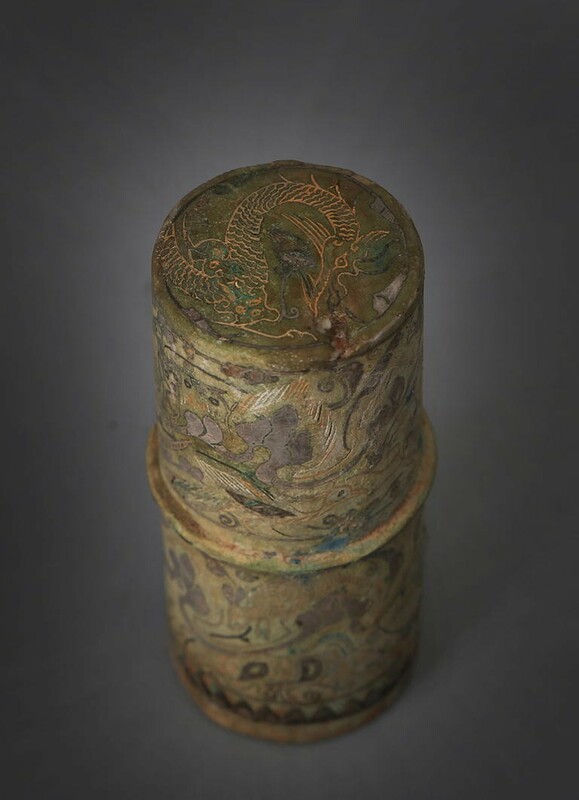 The lids are preserved and dragon-shaped hooks for draperies are attached to the side of the lids. The inner and the outer coffins and the main chamber compartment, the surrounding passage, and the storage compartments together formed a five-layer coffin compound, matching the coffin burial system originating in the Zhou 周 that followed the practice in the “Li lun 礼论” chapter of Xun zi 荀子 (Xun 1988: 359) that “the Son of Heaven is enclosed in a seven-layer coffin; a marquis, in a five-layer; a minister, in a three-layer coffin; and an individual, in a two layer coffin (天子棺椁七重, 诸侯五重, 大夫三重, 士再重).” The outer coffin is 3.71 m long from south to north, 1.44 m wide from east to west, and 0.46–0.96 m in remaining height. 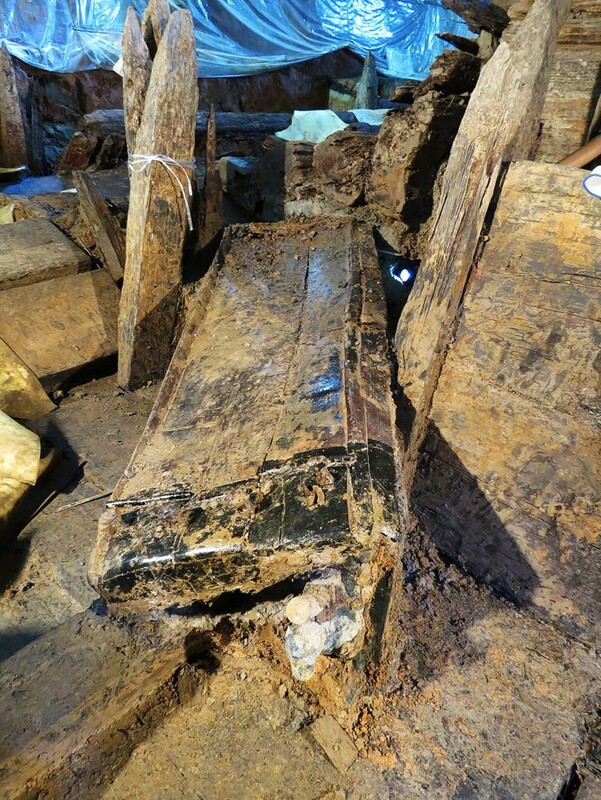 According to the height of the back boards, the original height of the coffin was about 1.36 m. The funerary couch 棺床 is about 0.26 m high, with four wooden wheels underneath. 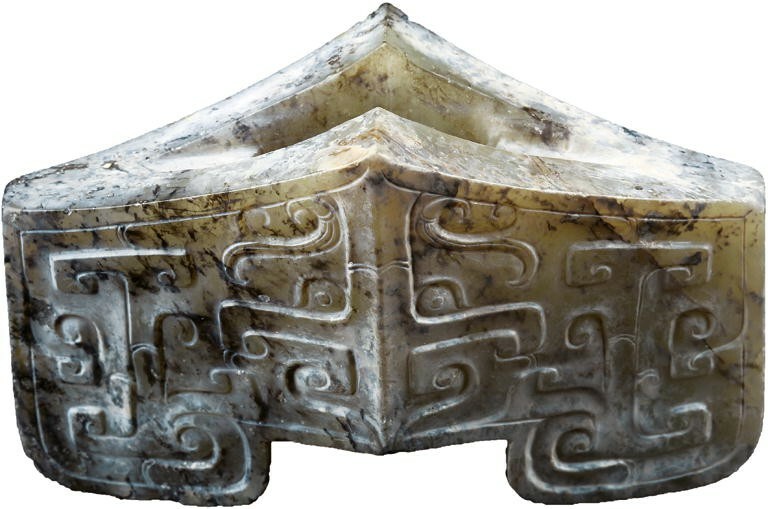 The lid of the outer coffin has traces of painting and three jade swords were placed on the top (Fig. 26). 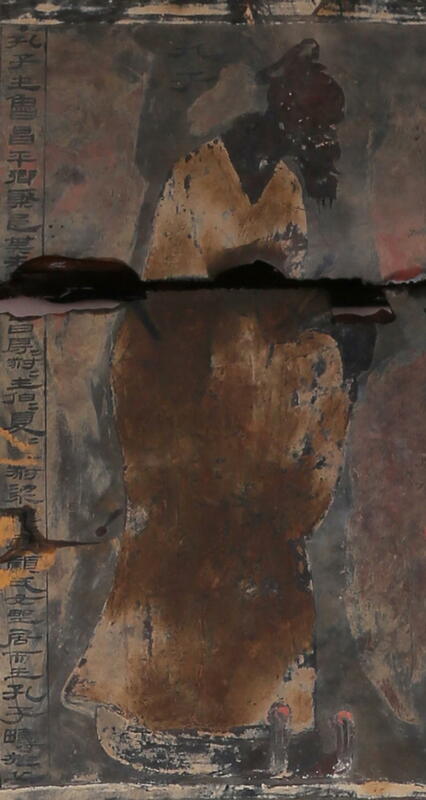 The lid of the inner coffin has painting and traces of fabric. Numerous gold, jade, and lacquer items were found in the south part of the space between the inner and the outer coffins (Fig. 27). The result of laboratory excavation shows that inside the inner coffin were remains of the deceased, whose head lies toward the south and feet toward the north. 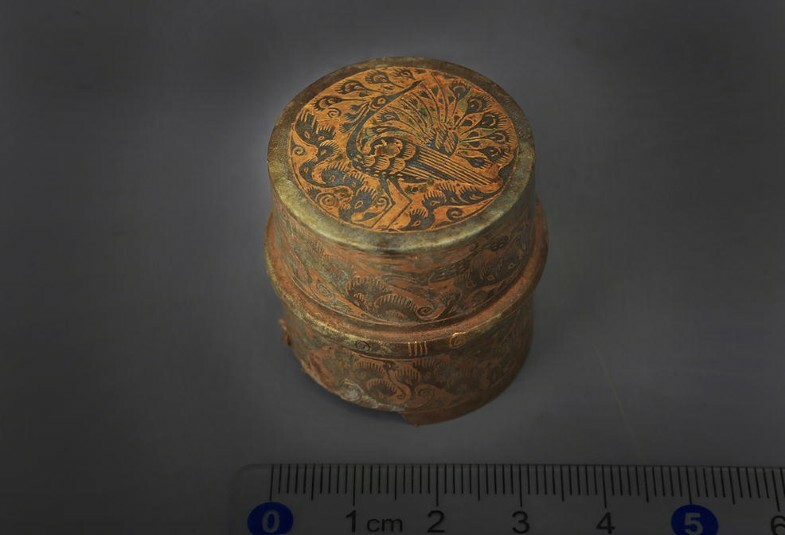 Some gold-attached lacquer boxes lay to the south of the deceased’s head, which was covered by a lacquer mask with an inlaid jade bi 璧 disk; the occupant’s teeth were preserved. Various sized jade bi disks are aligned along the body of the deceased and one jade sword, one letter knife, a belt hook, and jade ornaments were found near the waist area. 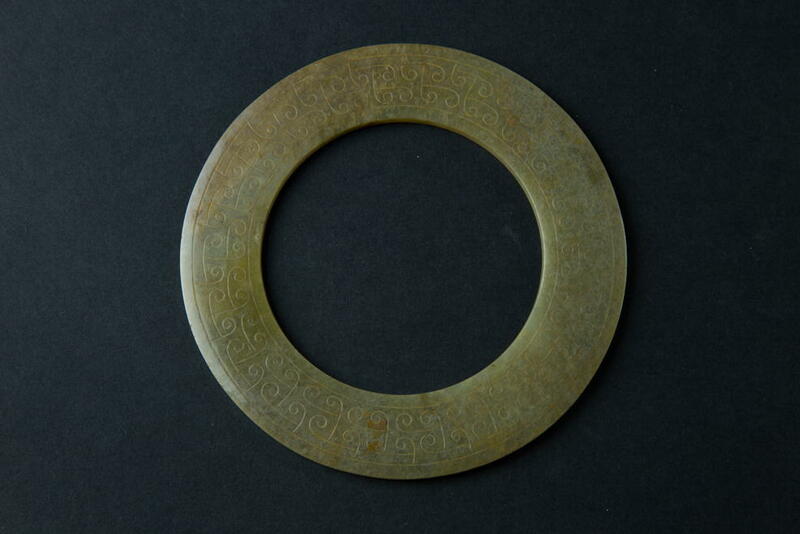 We also discovered a piece of a jade seal with the name “Liu He 刘贺” carved in it. 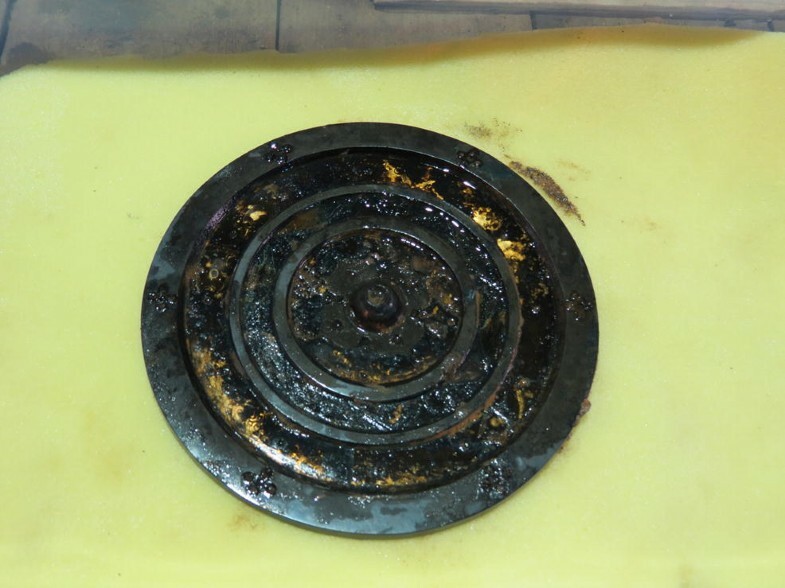 Some food was discovered in the deceased’s stomach. 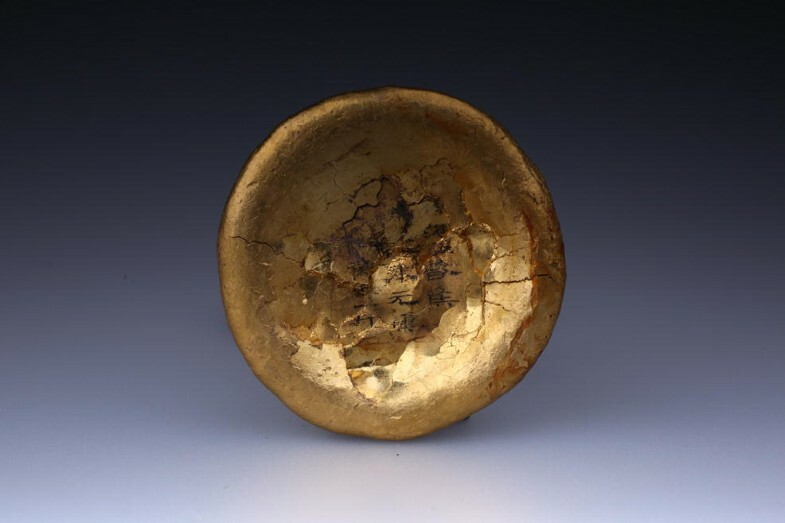 Under the deceased’s body there was a glass mat wrapped in gold thread, and under the mat were twenty sets of disk-shaped gold ingots, with five ingots per set for a total of 100 ingots (Yang et al. 2016) (Figs. 28, 29, 30, 31 and 32). The information from the excavation at present shows that the coffin chamber of the tomb had collapsed in early years and filled with ground water due to the impact of an earthquake during the Eastern Jin and the southern transgression of Poyang Lake during the Southern Dynasties 南朝 and Liu Song刘宋 period: because of this, several episodes of tomb robbing did no serious damage to the tomb. 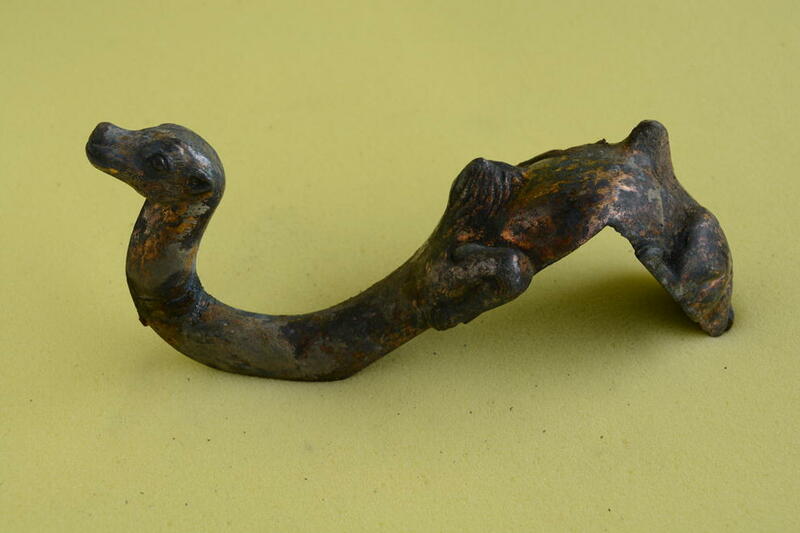 The objects generally remained unmoved, which is a rare case across China for excavations of high-ranking burials. 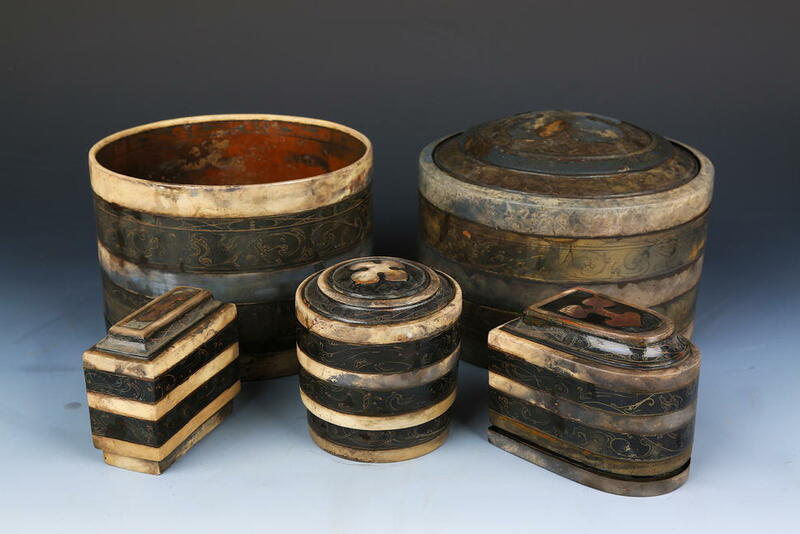 To date, the tomb has yielded over 10,000 delicate, precious items, including gold, bronze, iron, jade, lacquer, wood, and ceramics, as well as bamboo and straw weaving, fabrics, and bamboo and wooden manuscripts (the latter are tags and copies of memorials). 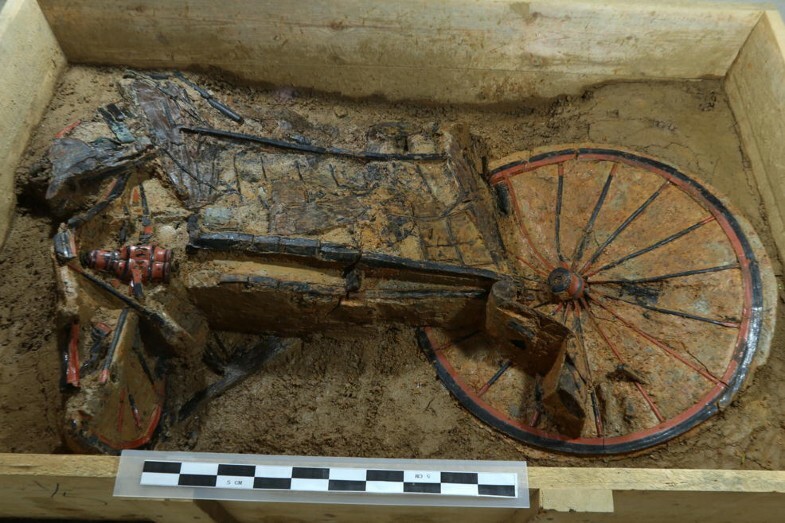 Among them, over 6000 items were discovered in the storage compartments, 1000 in the main chamber compartment, and over 3000 in the chariot pit. 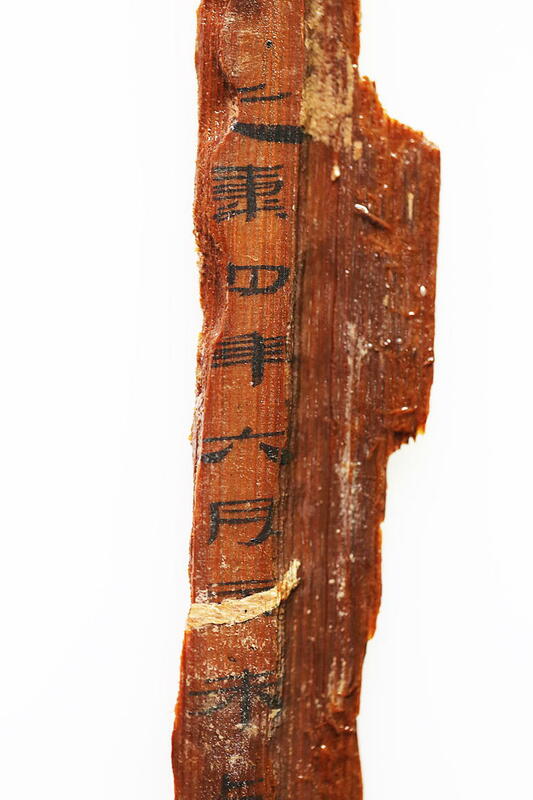 First, the thousands of bamboo slips and almost a hundred wooden slips bring several ancient texts to light, which is not only another huge discovery in the history of manuscripts but also the first time in the history of Jiangxi archaeology (Fig. 33). 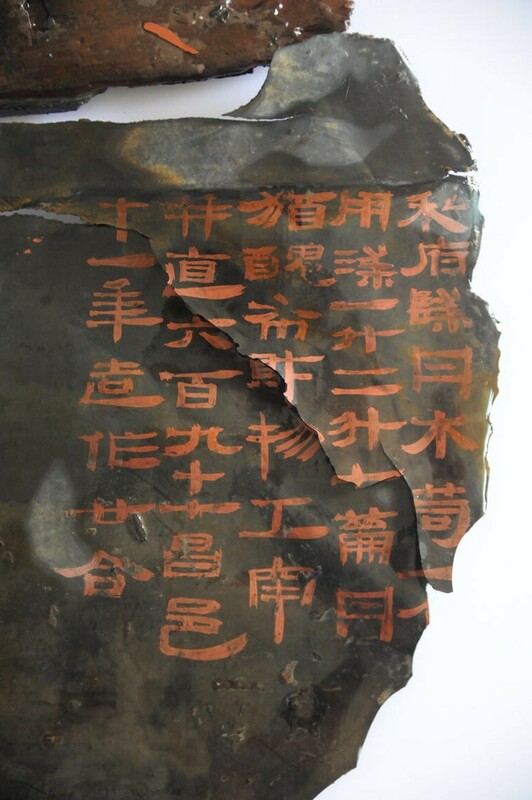 The laboratory excavation at present has revealed the content of the bamboo manuscripts, including “The Rhapsody of Mourning the Death悼亡赋,” the Analects, The Book of Changes 易经, the Book of Rites 礼记, The Classic of Filial Piety 孝經, The Book of Medicine 医书, and Manual for the Liu Bo Game 六博棋谱. We discovered a text titled, “Knowing the Way 知道” in the copy of the Analects in the tomb, which is highly possibly the missing Analects of Qi 齐论语. During the Western Han period, the Analects had three versions: Lu鲁, Qi 齐, and Gu 古. The main difference of the Analects of Qi, according to the “Yi wen zhi 艺文志” chapter of the Han shu 汉书, is that “the Analects of Qi has twenty two chapters, with the extras being “Wen Wang问王” and “Knowing the Way知道” (Jiangxi 2016a: 9). The modern Analects is a combination of the Analects of Lu and the Analects of Qi by Zhang Yu 张禹, the Marquis of Anchang 安昌侯 at the end of the Western Han. The Analects of Qi was lost in the Han or Wei魏 period. 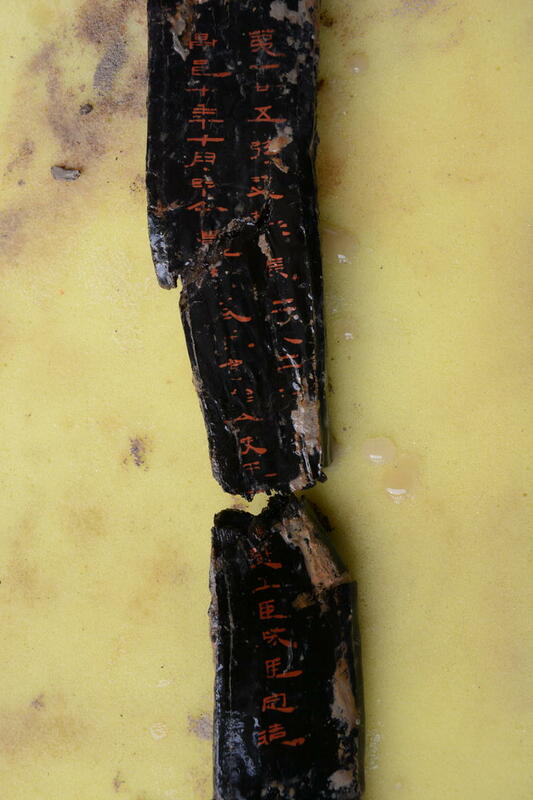 The Analects discovered in the Marquis of Haihun’s tomb is the earliest transcript of the Analects to date, and represents the early appearance of this classic and thus has significant value in philology and provides crucial reference for us to examine other similar manuscripts (Yang 2017) (Figs. 34, 35 and 36). “The Rhapsody of Mourning” has descriptions of tombs and graves (Fig. 37) (Lianyungang 1997: 21). 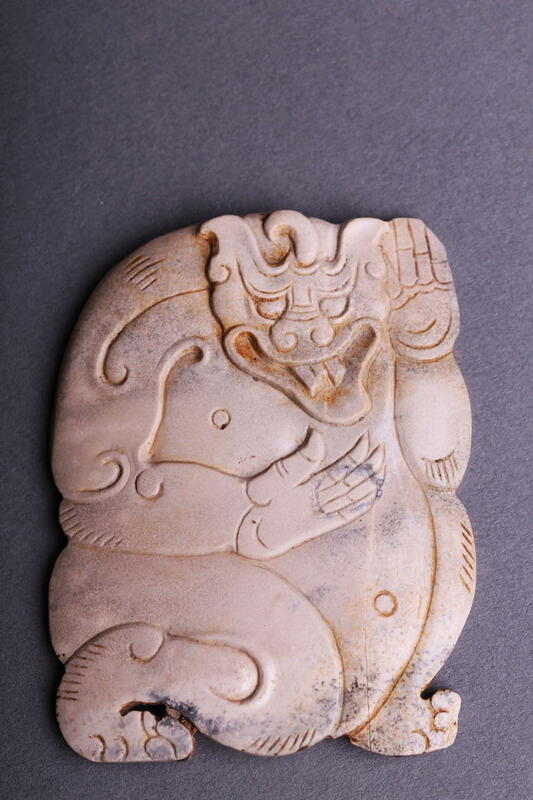 The Book of Changes starts with the meaning of each name of the gua 卦 divinatory diagrams, and the content and selection after “tuan 彖” is similar to that in the Day Book 日书. 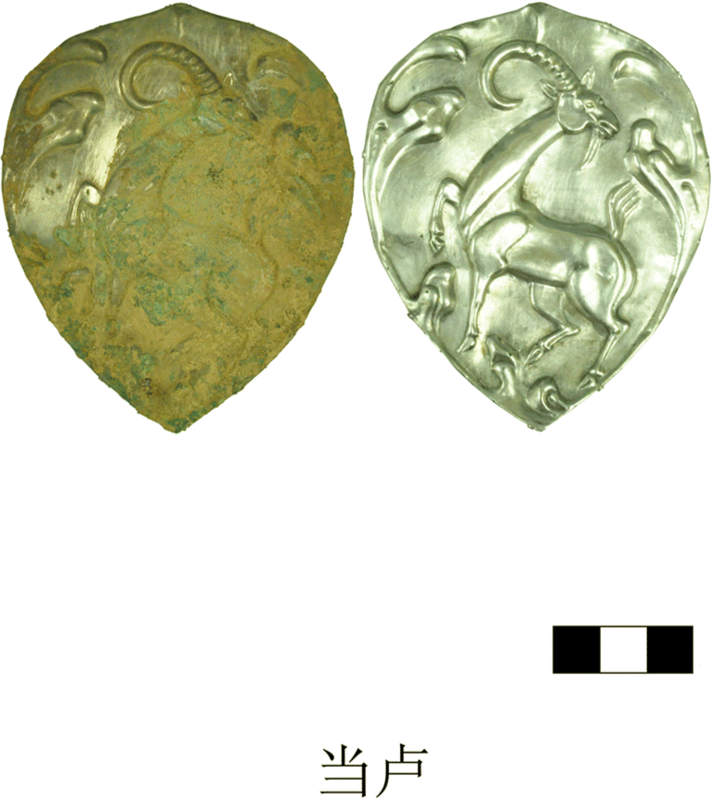 Although its arrangement is the same as the received version, the version discovered in the tomb of the Marquis of Haihun has different content (Beijing 2014: 207) (Fig. 38). The content of The Book of Medicine is related to health regimens and sexual practices. 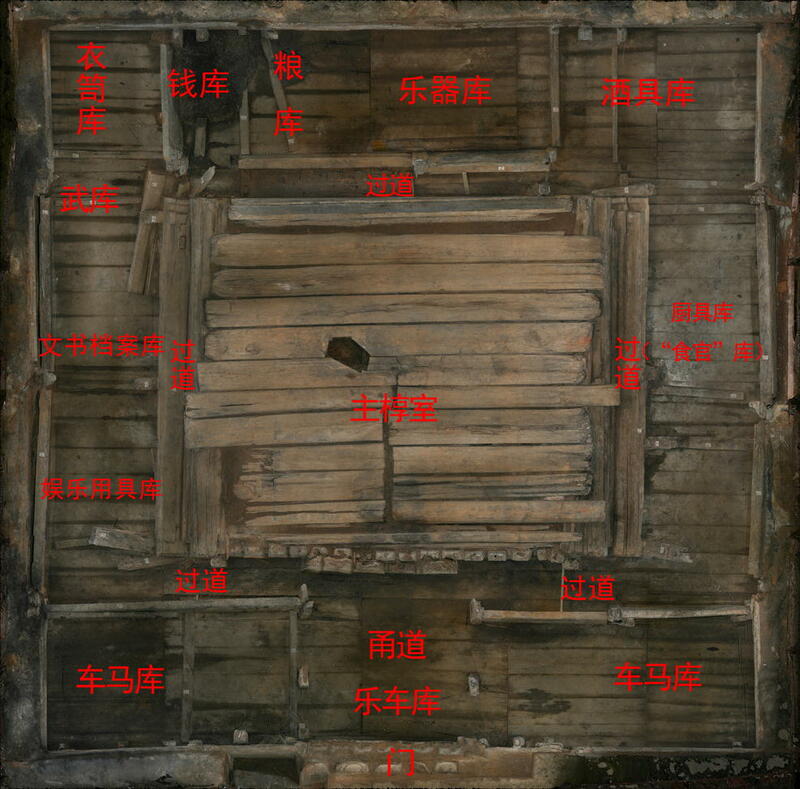 The author added “Xu 虚” and “Shi 实” into the “Eight Ways 八道” in the “Tian xia zhi dao tan天下至道谈” discovered in the silk manuscripts of Mawangdui 马王堆 and thus becomes the “Ten Ways 十道,” which reflects the development of sexual practices after the middle of the Western Han (Ge 1985) (Fig. 39). The Manual for the Liu Bo Game is the earliest such chess game manual to date. 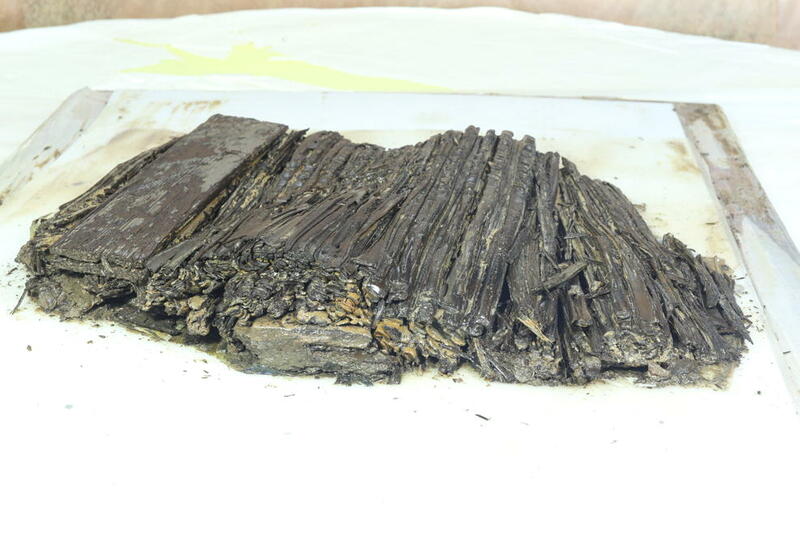 Comparing to the Bo ju zhan 博局占 on wooden slips discovered in the Han tomb in Donghai 东海, Yinwan 尹湾, in Jiangsu 江苏 (Jiangxi 2018), The Western Han Bamboo Manuscripts in Peking University V 北大藏西汉竹书(伍) (Beijing 2014), and the Xi jing za ji 西京杂记 (Jiangxi 2018; Wang et al. 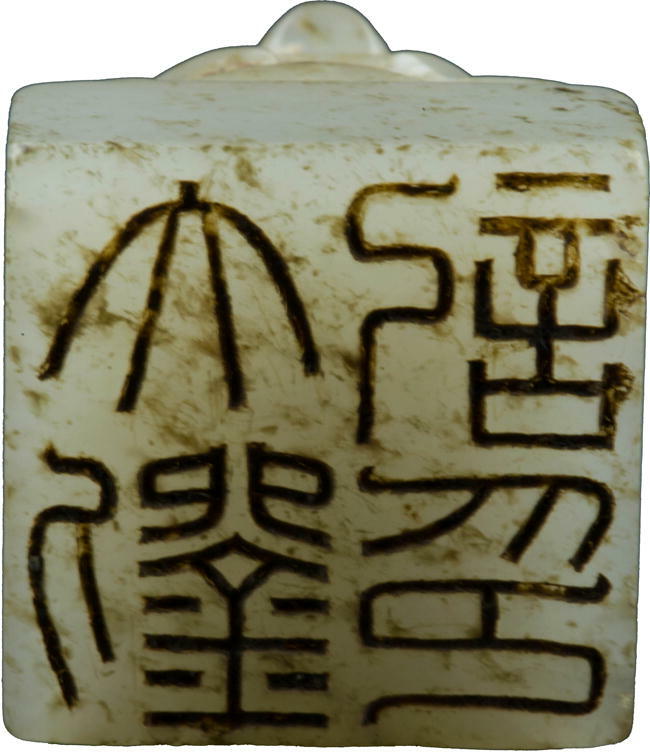 2017; Yang 2017; Zhou 1999), the playbook is the only record of Liu bo 六博and thus offers important information to understand and reconstruct the Liu bo game (Yang 1983: 46–47) (Fig. 40). 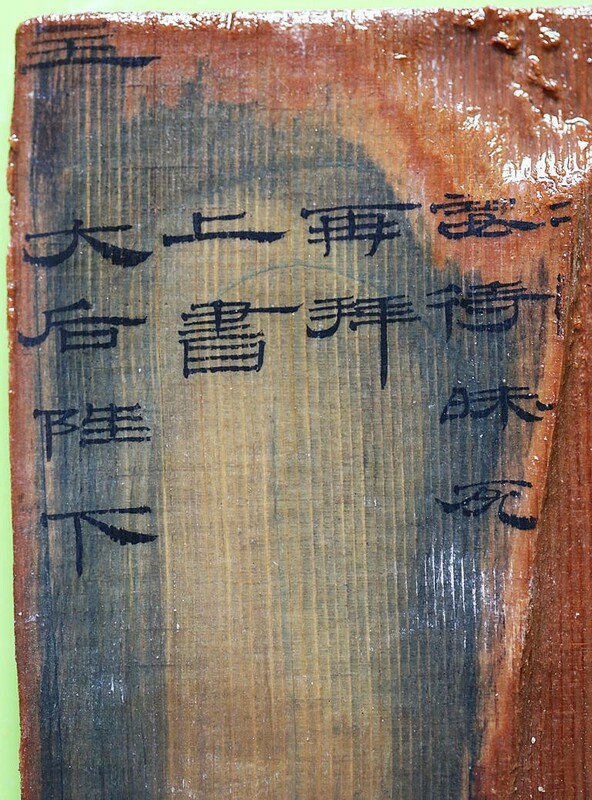 Wooden tablets mainly include lists and tags of burial goods and slips of memorials. 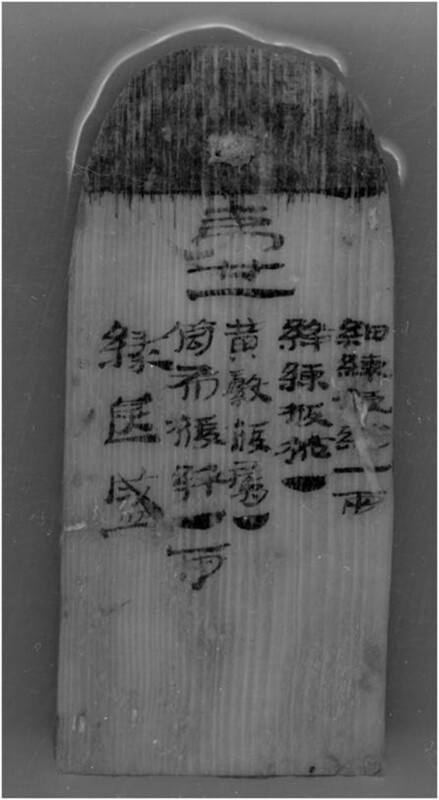 Tags are attached to bamboo or lacquer cases, with serial numbers and the contents of the boxes written on them (Wang 2016) (Figs. 41 and 42). 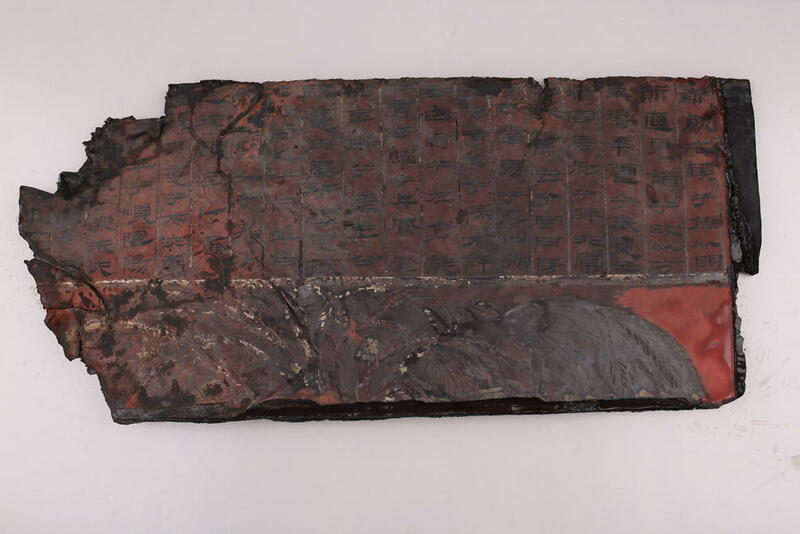 Slips of memorials are copies of documents that the deceased submitted to the emperor or the dowager empress (Figs. 43 and 44). 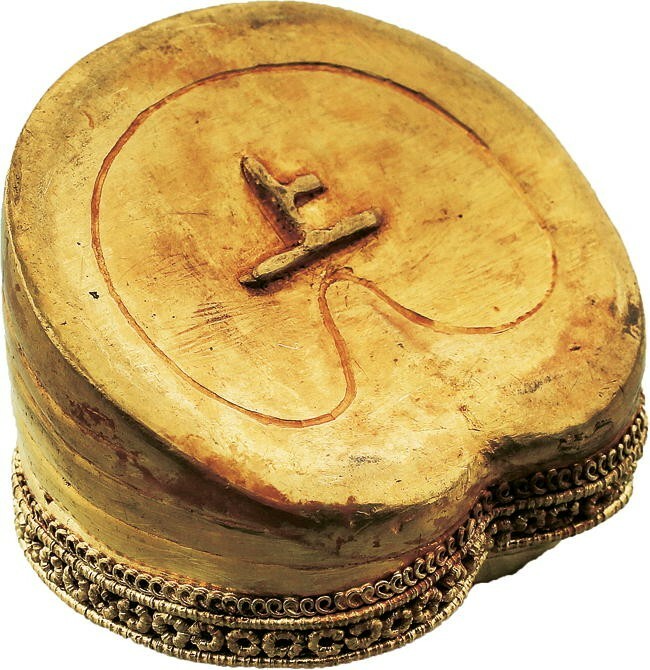 Second, the complete set of musical instruments, including two sets of bells, one set of chime stones, qing 琴, se 瑟, pai xiao 排箫, and sheng 笙, and 36 wooden figurines of musicians, visualized the music system of Western Han marquises (Figs. 45, 46, 47, 48, 49, 50, 51, 52, 53, 54, 55, 56 and 57). 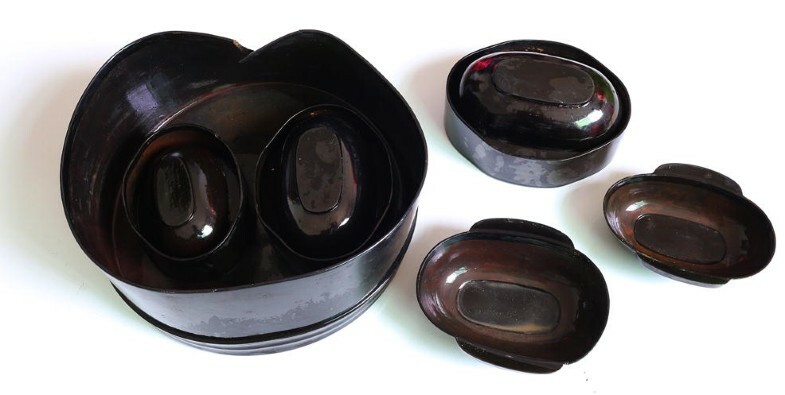 The bell sets, the chime stone set, and the musician figurines reflect the music and dance system that were inherited from the Rites of Zhou 周礼, which set up regulations such as “Marquises have suspended musical instruments of three sides 诸侯轩悬” and “Liu yi 六佾” in music and dances for marquises (Wang et al. 2016; Yang et al. 2018). Third, the five usable an che 安车 carriages and twenty horses yielded from the outer chariot pit, the two figurine sized double shafted music chariots with three horses each that are characteristic of leading chariots found in the corridor, and the many horse and personnel figurines of the following chariots discovered in the chariot storage compartments on the east and west side of the corridor show the regulations of the Western Han marquis’s chariot and inspection touring. 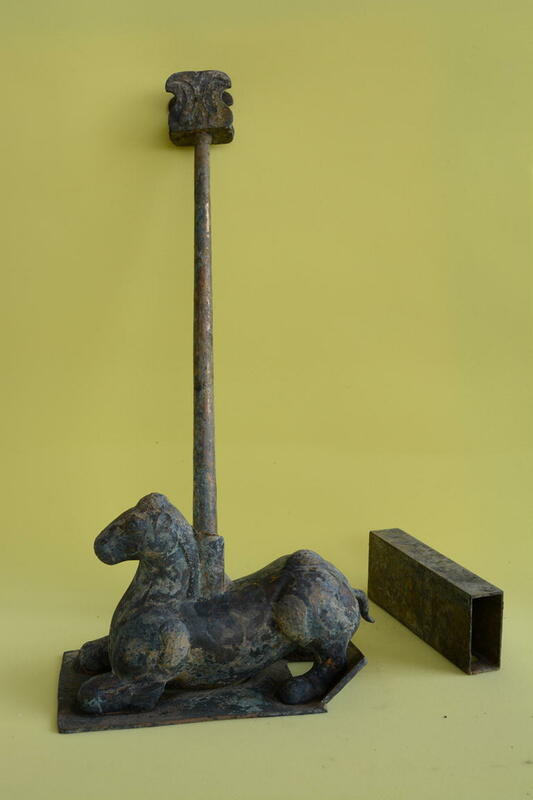 One of the two chariot figures, the “metal-adorned carriage 金车,” carries one usable bronze chun yu 錞于 and four bronze nao 铙 bells, and the other, the “drum carriage 鼓车,” carries a drum, which can provide us with a new interpretation of the coexistence of the terms “metal-adorned carriage” and “drum carriage” in the Western Han marquis’s chariot and inspection touring regulation, which may relate to the military music of the Pre-Qin period (Figs. 58, 59 and 60). 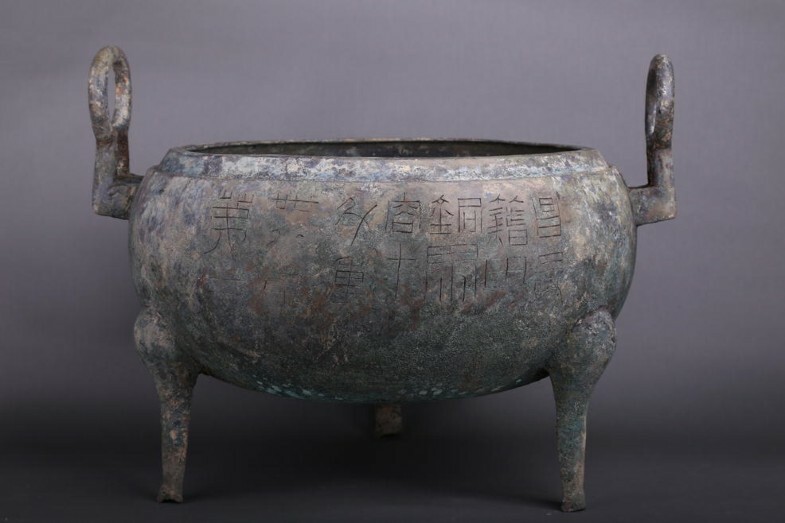 Fourth, the numerous bronze and lacquered-clay wine vessels and cooking wares, especially those with inscriptions such as Shi guan of Changyi 昌邑食官 and Jitian 籍田, reflect the Western Han system of shi guan 食官 food offices, the food culture, and the worship system that emphasized farming (Figs. 61, 62 and 63). 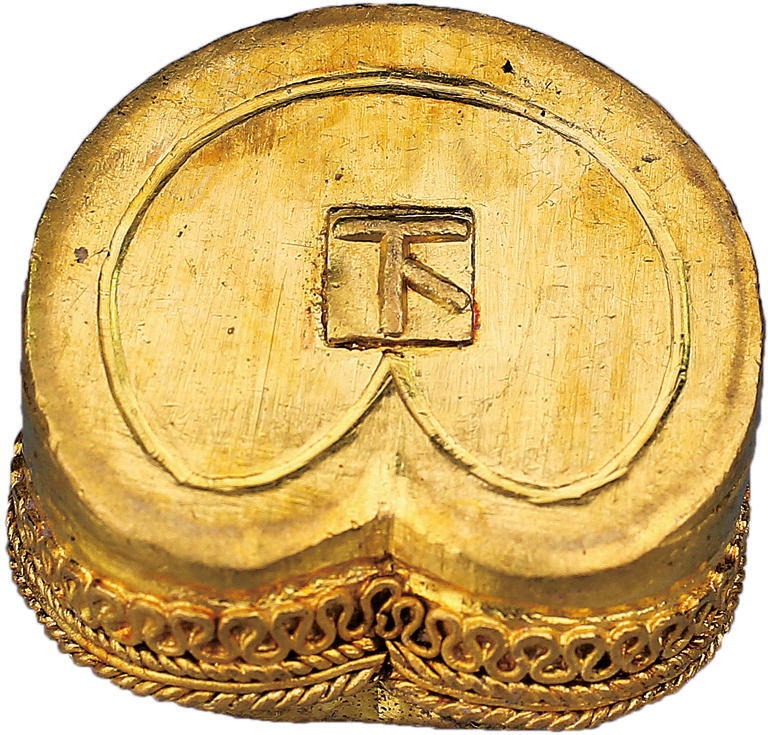 Fifth, the wu zhu 五铢 coins yielded from the tomb, amounting to over 10 tons and about two million pieces, show the Western Han system of bestowing gifts of money for funeral expenses (fu zeng 赙赠) (Fig. 64). 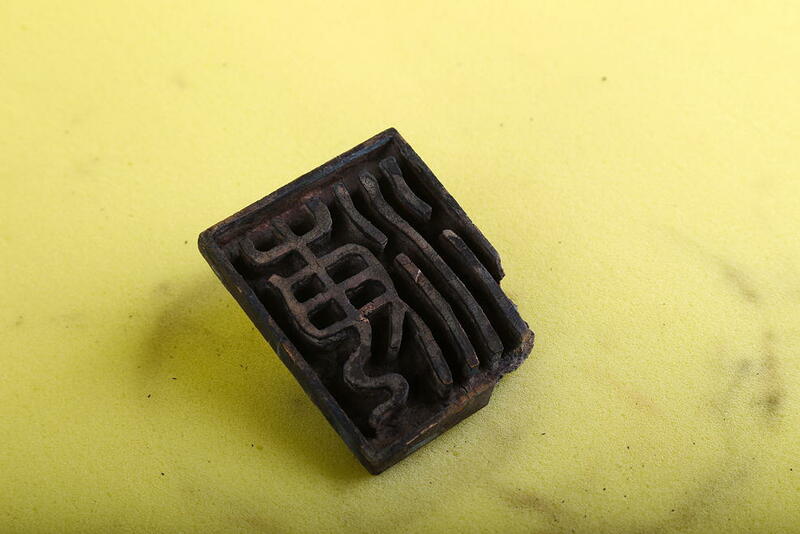 Through excavation we successfully obtained the information that in the Han period, 1000 “wen 文” was a basic unit, which proves that the currency system of “1,000 qian 钱 equals 1 guan 贯 (千钱一贯)” emerged at the latest before the middle of the Western Han, although it did not become a fixed regulation as in the Tang 唐 and Song 宋 Dynasties. 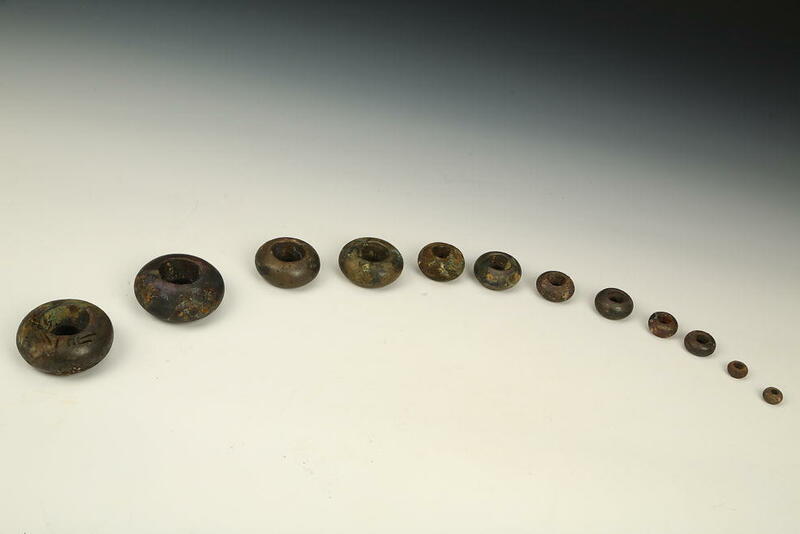 The diversity indicates the system was in an early and transformative stage and also reflects the system of saving coins after the period of Western Han Emperor Wu 武帝 (Liu et al. 2018). 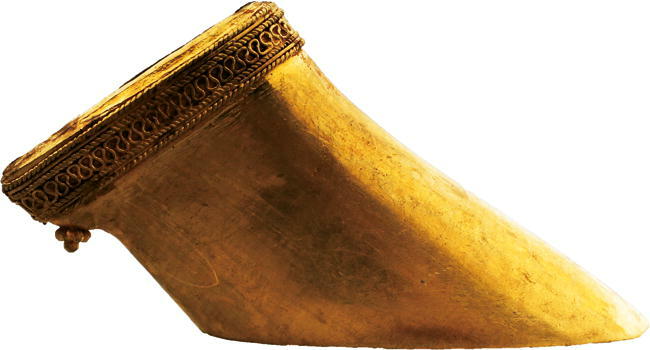 Sixth, the 478 pieces of horse-hoof shaped and lin 麟 unicorn toe shaped gold ingots, disk-shaped ingots, and gold plaques 金板 are the most complete and well-preserved, and the most concentrated such discovery in the history of Han tomb archaeology in China. 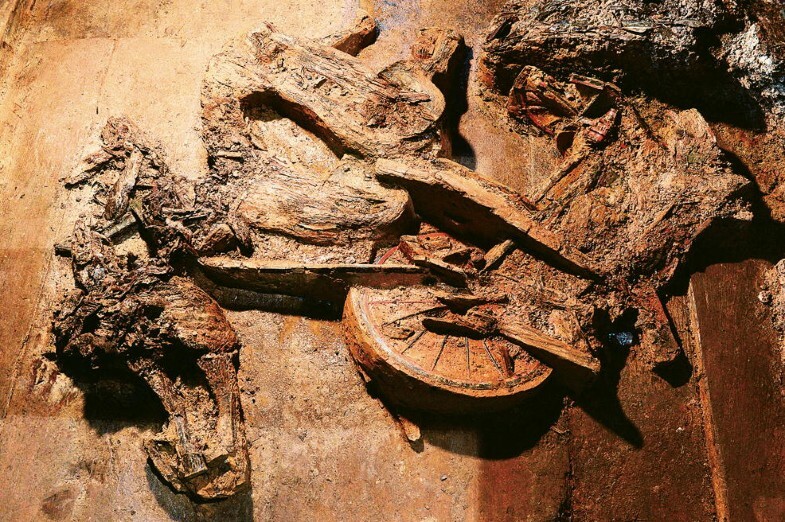 458 pieces of disk-shaped ingots, horse-hoof shaped and lin-unicorn toe shaped ingots were discovered in the north of the west room of the main compartment, the south part of the space between the inner and the outer coffins, and the bottom of the inner coffin. 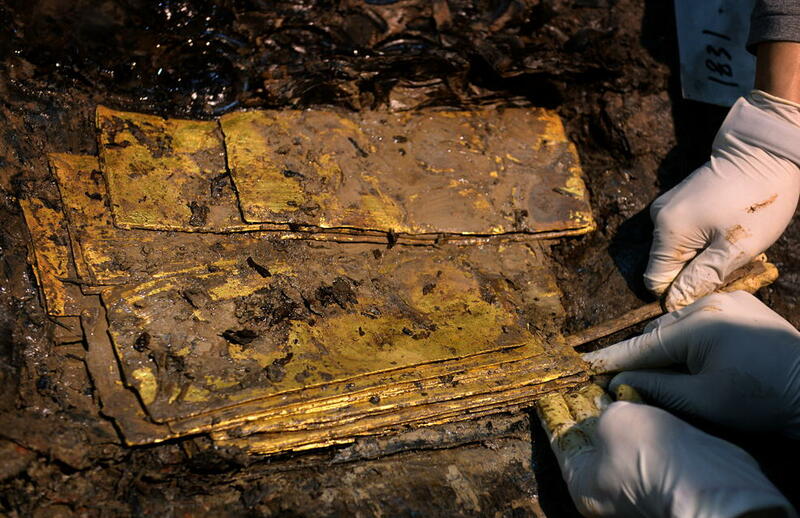 The 20 pieces of gold plaques are located in the south of the space between the inner and the outer coffins. 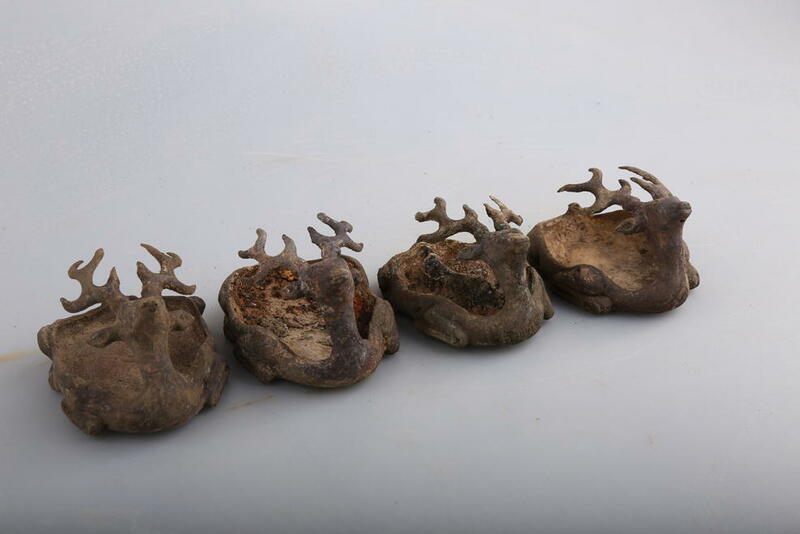 A box of 15 horse-hoof shaped and 10 lin-toe shaped ingots, two boxes of disk-shaped ingots, which carry 88 and 99 ingots, along with 2 extra ingots, were located in the west room of the main compartment. 33 horse-hoof ingots, 15 lin-toe ingots, and 96 disk-shaped ingots were placed between the inner and outer coffin. 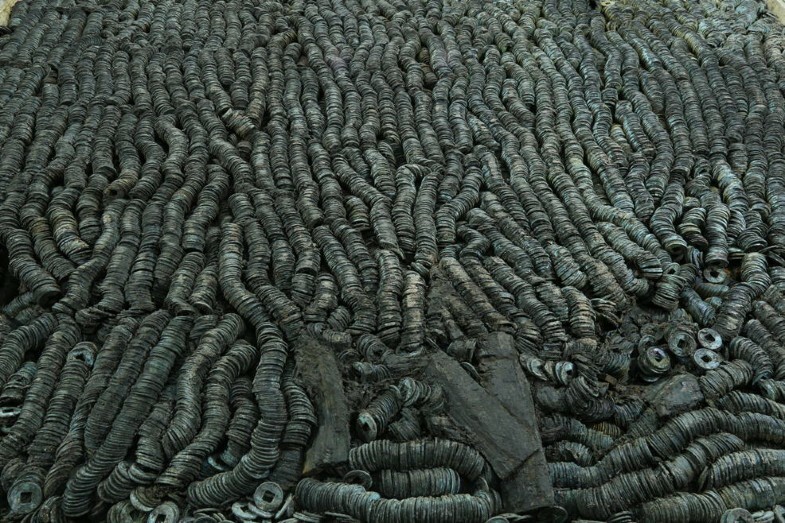 Under the glass mat there were lines of twenty sets of disk-shapes ingots, organized with five ingots per set for a total of 100 ingots. The horse-hoof shaped and the lin-toe shape ingots were the gifts bestowed by the Western Han emperors in order to “accord with an auspicious occasion 协祥瑞.” Made with fine metal production techniques such as filigree inlaid, some pieces carried inscriptions of “shang 上,” “Zhong 中,” and “xia 下” (upper, middle, and lower) and some have glass inlay. 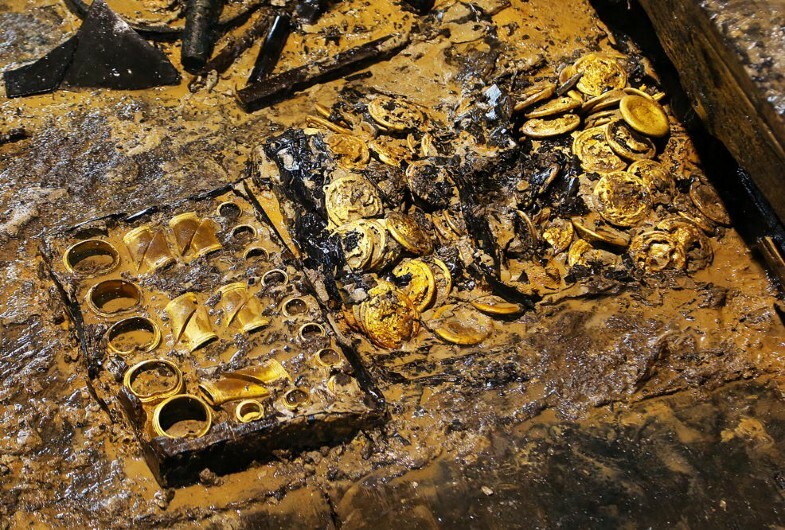 Disk-shaped ingots and gold plaques are value-stored hard currency. They were used as reserved wealth when the deceased was alive and for the sponsoring of worship when the emperor worshiped in the ancestral hall every August. 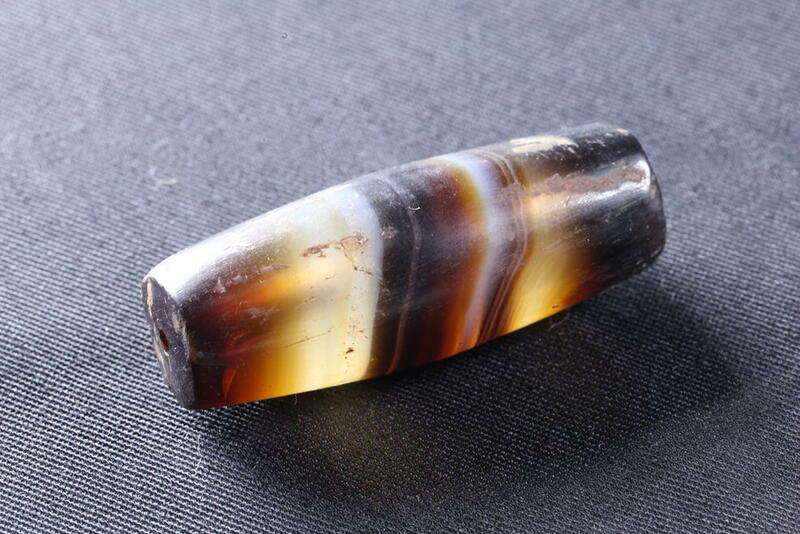 Kings and marquises were required to sponsor the worship with ingots according to the population of their states. 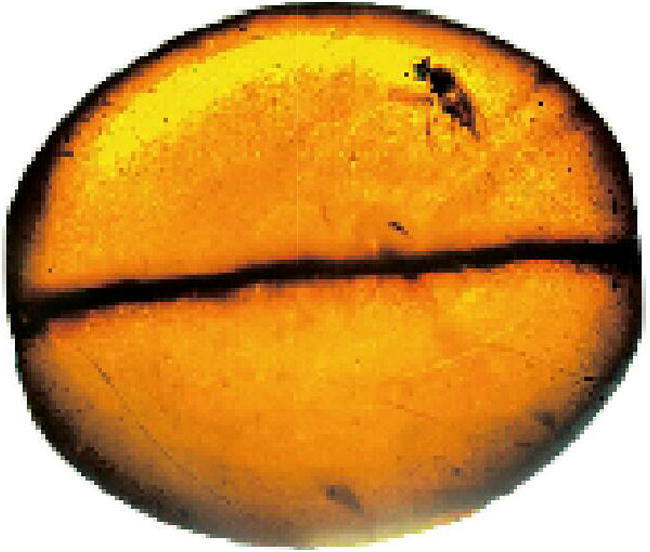 Records also show that kings and marquises would be degraded if the gold they presented had insufficient weight or purity (Figs. 65, 66, 67, 68, 69, 70, 71, 72, 73 and 74). Seventh, all of the grave goods represent the superb achievements of Western Han handicrafts and the luxurious lives of high-ranking aristocrats, and they are also the typical representation of the concept of “treating the dead as treating the living.” There are: (1) plentiful exquisitely made objects of gold and silver, inlaid, gold-wrapped, and gilded bronze objects, such as chariot and horse fittings, musical instruments, dragon-shaped hooks of the coffin cover, Boshan 博山 incense burners, multi-armed lamps, goose and fish lamps, ding 鼎 tripod vessels, ran 染 stoves, tripods for heating, distillers, mirrors, and weights (Figs. 75, 76, 77, 78, 79, 80, 81, 82, 83, 84, 85, 86, 87, 88, 89, 90, 91, 92, 93, 94, 95, 96 and 97); (2) jades, such as she 韘-shaped (archer’s thumb ring shaped) plaques with openwork dragon, tiger, and phoenixes, bi disks, rings, swords, plaque sets, belt hooks, cups, and seals (Figs. 98, 99, 100, 101, 102, 103, 104, 105, 106, 107, 108, 109, 110, 111, 112 and 113); (3) gems, such as agate, turquois, and amber (Figs. 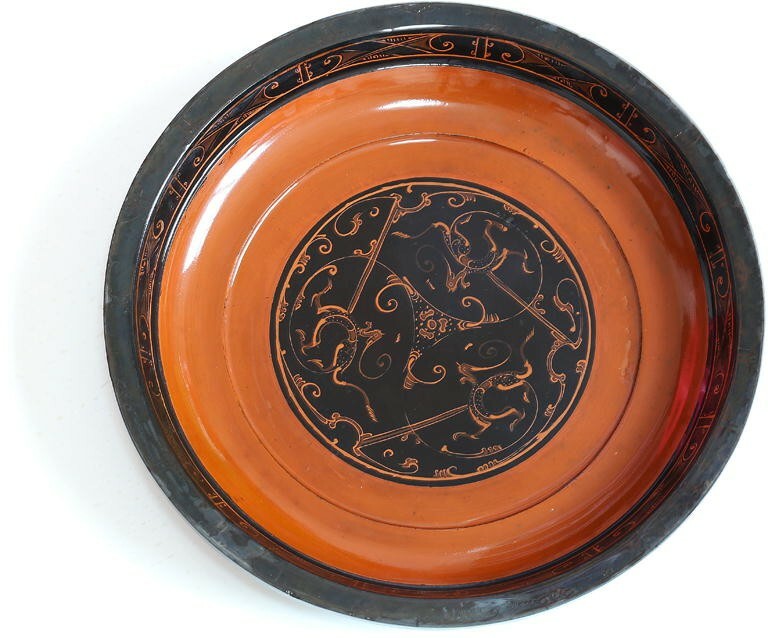 114 and 115); and (4) lacquer wares with refined paintings, such as the mirror painted with figures and stories of Confucius and his disciples, chess board, plates with silver rim, boxes with gold foil attached, lacquered zun 樽, and a table inlaid with jade and agate (Figs. 116, 117, 118, 119 and 120). 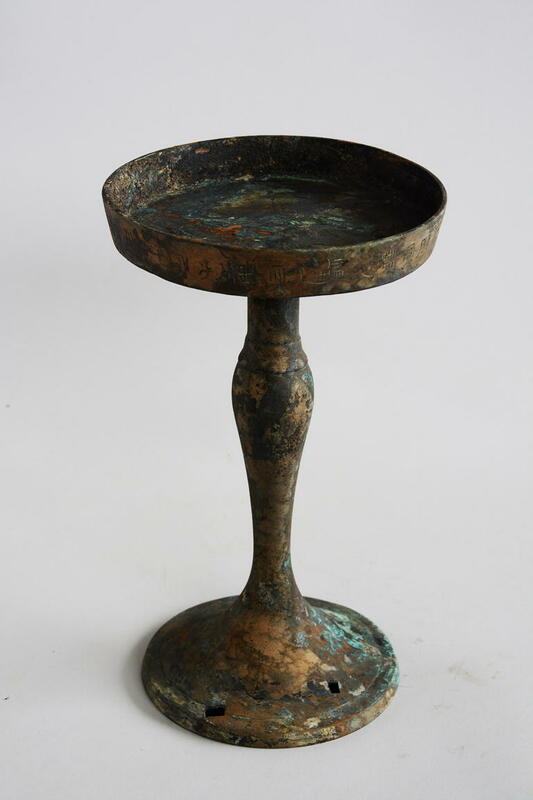 Some of the bronze, lacquer, and wooden chamber boards are inscribed with the names of craftsmen and their organizations, size, weight, materials, expenses, and manufacturing date, thus reflecting the name marking system 物勒工名 in handicraft production inherited from the Eastern Zhou period (Fig. 121). The Confucius dressing mirror, which also functioned as a screen, consists of three parts: the body, the back, and the cover. The body of the mirror is a rectangular bronze board with a smooth and clean surface and no decoration and is embedded into the mirror back. The mirror body is 70.3 cm in length, 46.5 cm in width, and 1.3 cm thick, and the edge is 1.2 cm thick. 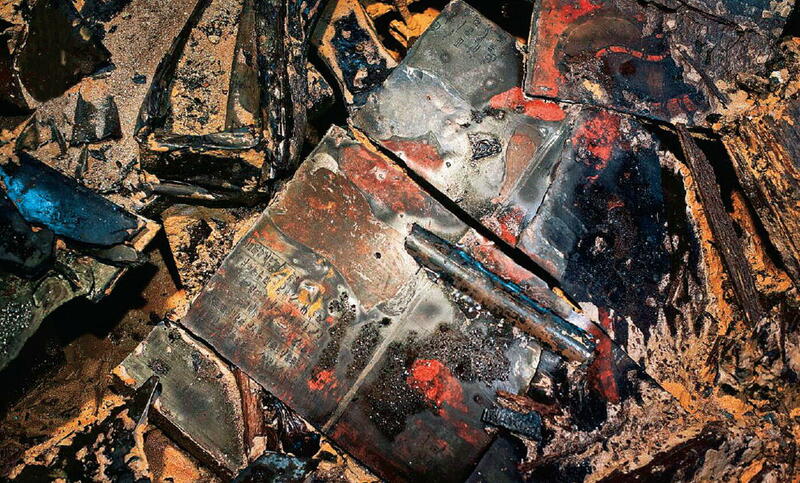 The mirror back is made of wood and is well-preserved, with the interior and the exterior both painted red. The mirror back is 96 cm long, 68 cm wide; the middle part, where the mirror body is embedded, is 6 cm thick, and the frame is 11.8 cm thick. 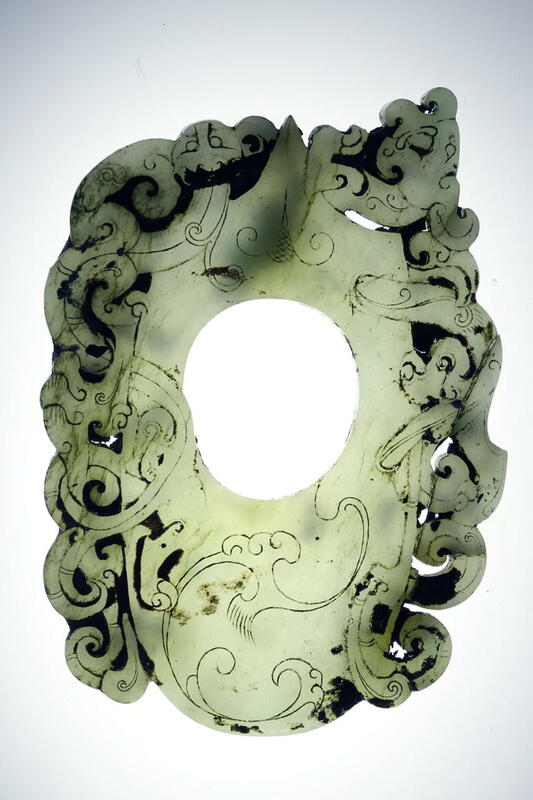 The surface of the mirror back has figures depicting stories of Confucius and his disciples. There are six painted figures that can be divided into three layers, along with notations with more than 1500 characters. The upper left has the figure of Confucius, the upper right portrays Yan Hui 颜回; the middle left features a figure of Zi Gan 子赣 / Zi Gong 子贡, and the middle right shows Zi Lu 子路; the lower left has a figure of Tangdai Zi Yu 堂骀子羽/ Dantai Mie Ming 澹台灭明, with the combined biography of Zi Yu 子羽 and Zai Yu 宰予, and the lower right has a figure of Zi Xia 子夏. The upper frame has paintings of a phoenix and the Queen Mother of the West and King Father of the East; the left frame is painted with a blue dragon 仓(苍)龙and the right with a white tiger. The painting on the lower frame is blurred but was probably a black crane, according to the “The Rhapsody of the Dressing Mirror 衣镜赋.” The cover of the mirror is wooden, which is also covered with red on both the interior and exterior, but is seriously damaged. 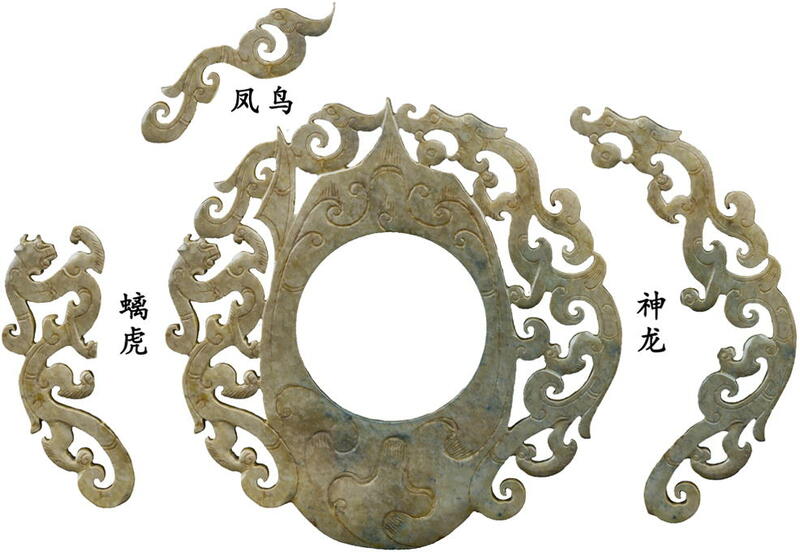 The mirror cover is attached to the mirror back with two bronze hinges, which can be opened and closed like doors and thus can protect the mirror body by covering it. On the surface of the mirror cover is the 130 character text of “The Rhapsody of the Dressing Mirror” on the upper part, and the lower part has a painting of “Zhong zi listening to qing 钟子听琴.” There are also remains of decorations such as cranes and clouds. 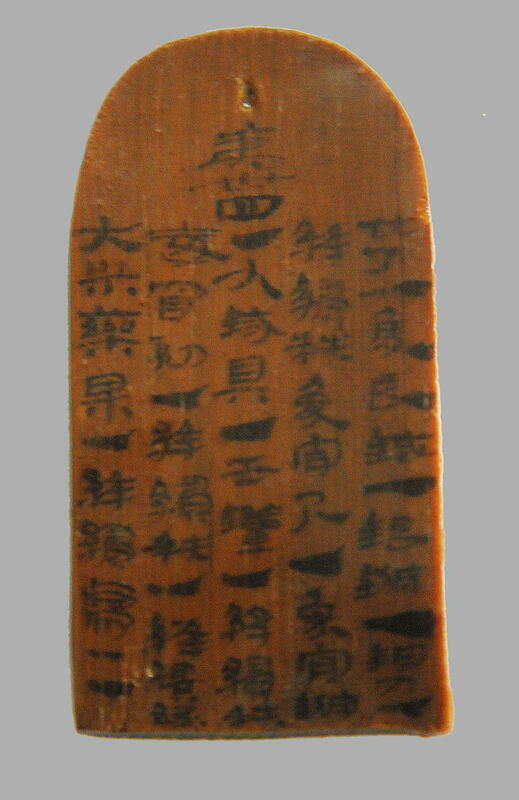 The backside of the mirror cover has two disciples’ painted figures and biographies, among them about two hundred characters can be recognized. 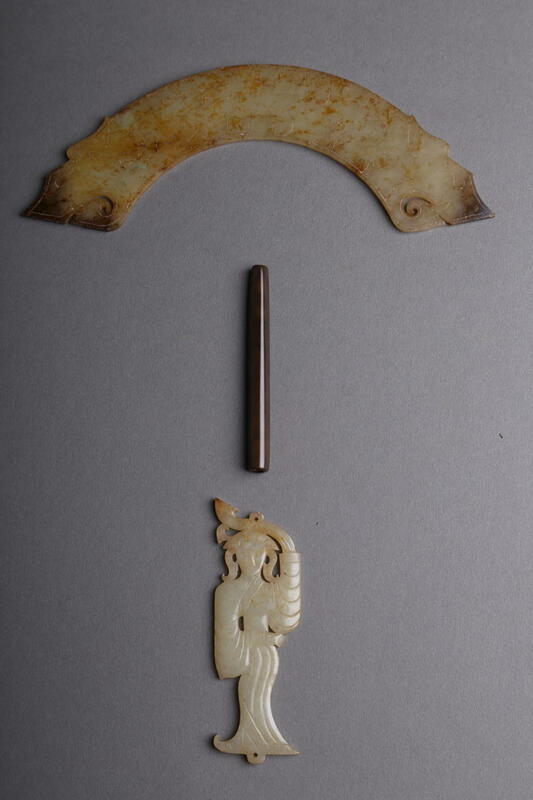 The upper left side of the cover is a figure of Zi Zhang 子张, and the upper right has Ceng zi 曾子. 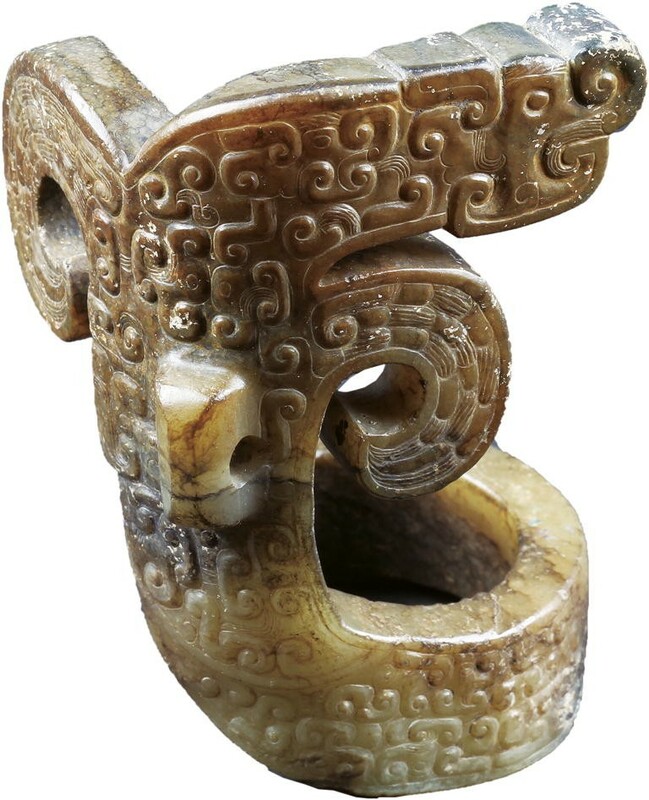 Exotic style objects, such as the camel image on the hanger of a bronze bell, the silver horse mask in a single-horn goat shape, the jade ornament of tiger and bear combat, etched carnelian beads, agate, crystals, and the soda-lime glass inlaid on the horse-hoof and the lin-toe ingots, provide precious information for the study of cultural interaction between China and the west (Figs. 129, 130, 131, 132, 133 and 134). 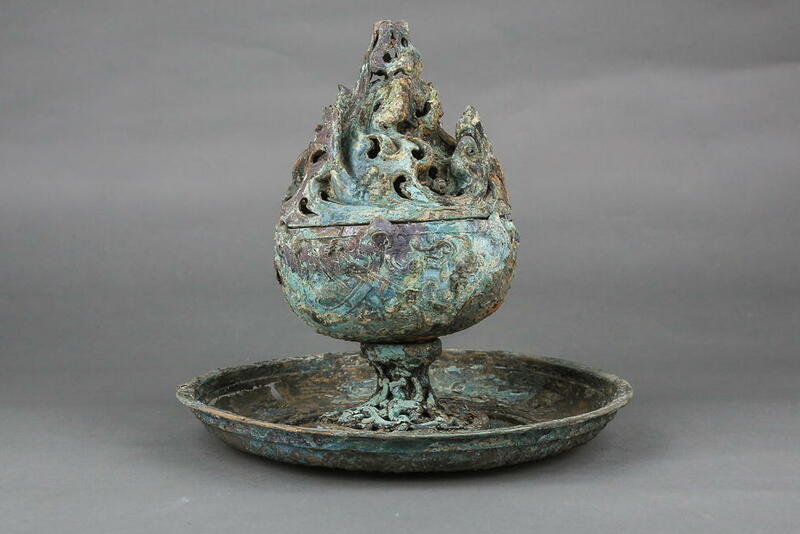 In addition, on the base of a bronze dou 豆shaped lamp there is a clear inscription reading “Nanchang 南昌,” offering the most precious evidence of the existence of Nanchang City at this time (Fig. 135). According to textual records, the Marquis of Haihun’s tomb is located in the principality headed by Liu He 刘贺, the king of Changyi 昌邑王 and the Marquis of Haihun 海昏侯 during the Western Han Dynasty. There is a clear historical background for this person. 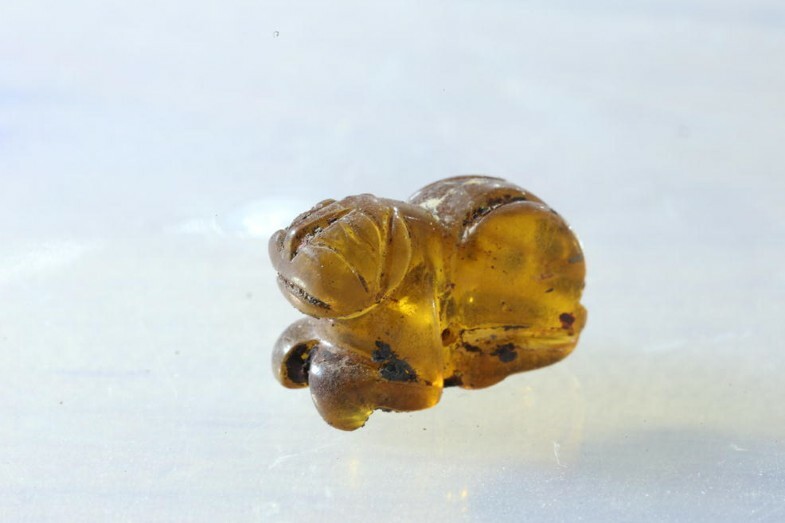 The abundant relics, the complete structure of funerary park, the remains of high-ranking buildings, the prominent characteristics of the burial, and the clear relationship between the tomb and the capital provide multiple lines of evidence toward the identity of the deceased. 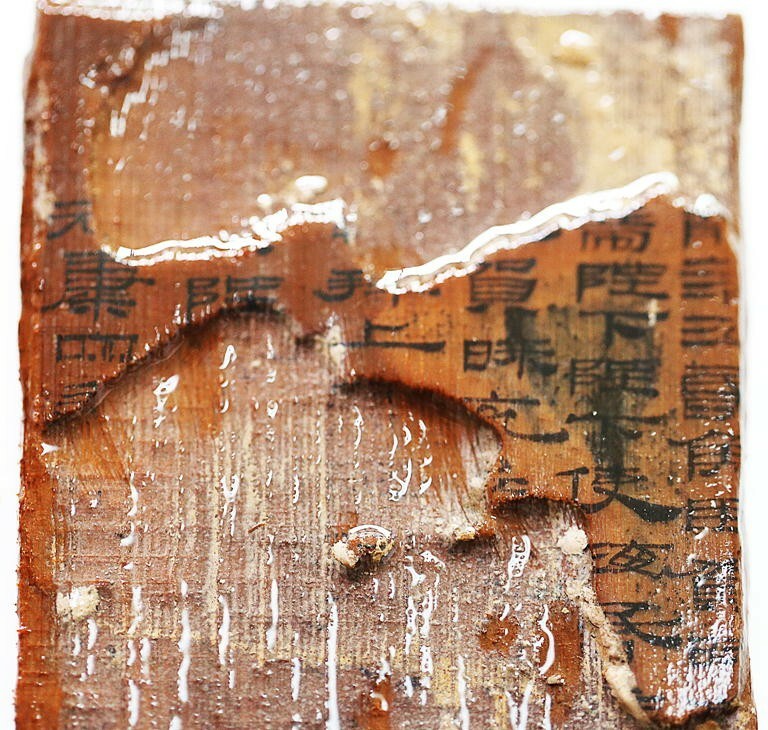 In particular, the ink-written name and dates on the wooden slips and gold disks, such as “Congratulations to the Marquis of Haihun 海昏侯臣贺,” “In the tenth month of the third year of Yuankang 元康三年十月,” and “In the sixth month of the fourth year of Yuankang 元康四年六月,” and the jade seal with the name of “Liu He” yielded from the inner coffin, clearly suggest that the deceased is the first Marquis of Haihun, Liu He, who was also the ninth emperor of the Western Han and the second generation of the kings of Changyi (Figs. 136, 137, 138 and 139). Liu He’s grandfather was Emperor Wu and his grandmother was the beautiful Lady Li 李夫人. Liu He succeeded the throne of the king of Changyi at the age of 6 and was enthroned as emperor by Huo Guang 霍光 at age 19. 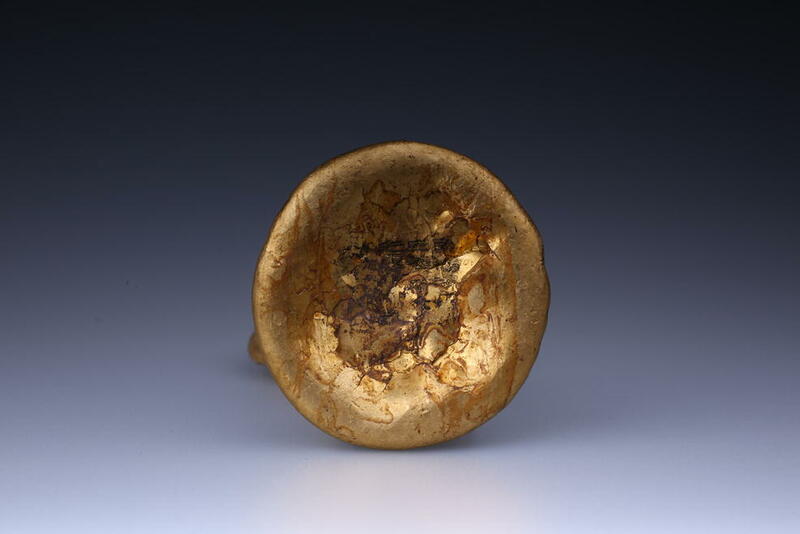 However, Liu He had owned the crown for only 27 days when Huo Guang dethroned him and sent Liu He back to Changyi. Liu He therefore became a commoner living under surveillance but still possessed all of the wealth that originally belonged to the royal house (Han 1964: vol 63, pg. 2765). After ten years passed, considering that fact that Liu He had no ambitions to reclaim the power and the familial relationship, Emperor Xuandi 宣帝 re-established Liu He to Yuzhang 豫章 as the Marquis of Haihun and bestowed upon him four thousand families as shi yi 食邑 in the third year of Yuankang 元康三年 (63 BC). This reestablishment had two provisos: first, Liu He had to leave wealthy Shandong and move to the distant and poor territory of Nan Bo 南藩; and second, Liu He could never come back to the Han Chang’an 长安 capital to attend ancestral worship and to have audiences with the emperor (Han 1964: vol 63, pg. 2769). Several years later, Ke, the regional inspector of Yangzhou, reported that Liu He had contact with the prior Grand Protector’s clerk, Sun Wanshi. [Ke said that] Wanshi had asked Liu He that: “When you were going to be dethroned, why didn’t you persist to stay in the palace and kill the Grand General, but allowed people to take away the seal?” Liu He said: “I did, but failed.” Wanshi also suggested that Liu He would become Marquis soon because he had been assigned to be the Yuzhang king. Liu He said: “I will, but it is not proper to discuss.” Officials in charge investigated and requested an arrest, [and the emperor] determined: “cut the three thousand families [from the shiyi食邑]” (Han 1964: vol 63, pg. 2770). 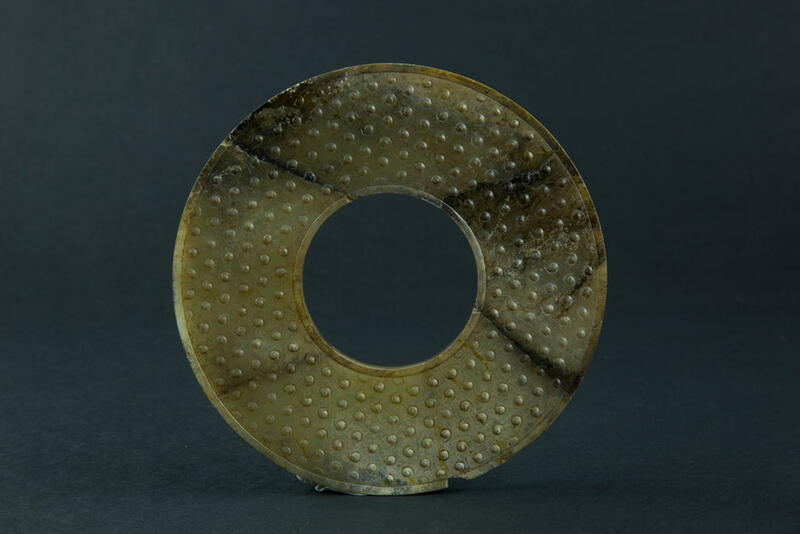 Liao, The Grand Protector of Yuzhang, suggested: “Shun established Xiang in Youbi but did not appoint Xiang’s son after Xiang was dead, because Shun thought that disorderly people should not be the beginning of a lineage. Now Liu He, the Marquis of Haihun, is dead, the one who was suggested to succeed him, Chongguo, is dead; the one who was then suggested, Fengqin, is also dead. It is Heaven who wants to end their lineage. Your majesty is sagely and virtuous and treated Liu He so kindly, even better than how Shun did to Xiang. It is proper to end Liu He’s lineage according to the rites, in order to obey the order from Heaven. Please address the relevant officials for discussion” (Han 1964: vol 63, pg. 2770). The discussion concluded with a refusal to set up a successor for Liu He, and the Haihun Principality was thereby terminated, which was represented as “Heaven ends the royal house of Changyi (天亡昌邑王族)” in the received texts (Han 1964: vol 63, pg. 2770). Later, Han Emperor Yuandi 元帝re-established the line by naming Liu Daizong 刘代宗, the third son of Liu He, to be the second Marquis of Haihun. Thus, because of the events of his legendary life, Liu He is one of the most disputed figures in Han Dynasty history: his succession as a king, his becoming Han emperor but then being dethroned, his being suspected and feared by Han Xuandi, and his being re-established as the Marquis of Haiyun only to be degraded and stripped of the following families of his shi yi, and finally his son being crowned again. After Liu He’s death, his family members all became commoners and no longer had the right to succession and use of the wealth of the marquisate. Among these assets was all of the wealth granted to Liu He after he was dethroned as emperor but was then permitted to succeed the first king of Changyi, Liu Bo 刘髆, as well as the wealth he gathered when he was emperor and then brought with him when he left the imperial palace, and then when he was the King of Changyi and the Marquis of Haihun. For the officials who came to oversee the funeral arrangements, the easiest way to deal with the problems associated with the disposition of his assets was to bury all of the items with marks of belonging to the king or marquis in his grave. This is the main reason that the tomb of the Marquis of Haihun yielded such abundant grave goods. 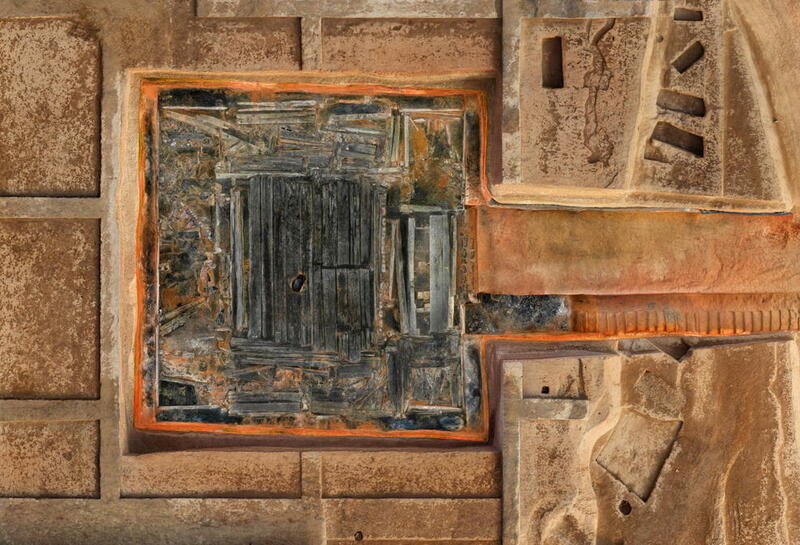 Due to the plentiful wealth, the tomb had to be large in scale. 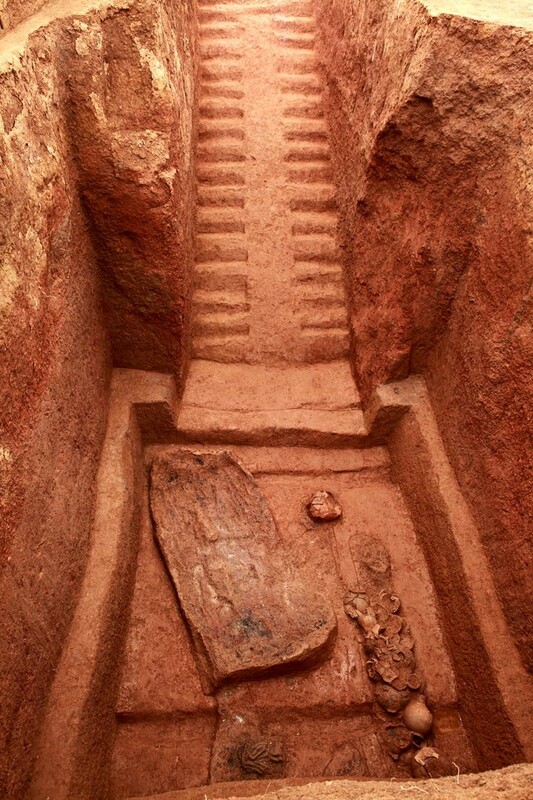 However, there were regulations regarding marquises’ burials, including the use of certain types of garments, and the appropriate worship rituals, coffins and chambers, tomb pit, location, and the funerary park, as can be seen in the Zang lü 葬律 (The Law for Funeral Rites), discovered in Shuihudi 睡虎地 tomb M77 discovered in Yunmeng 云梦, Hubei 湖北, in 2006 that dates to the early Western Han period (Hubei 2008; Peng 2009; Gao 2011). Liu He could not violate the regulations of The Law for Funeral Rites, such as those concerning the ancestral hall, the mound, burial chambers, coffins and chambers, clothing, and applied funeral equipment that required the emperor’s bestowal, such the use of the imperial burial chamber style of the Han Dynasty known as huang chang ti cou 黄肠题凑 and the jade suit with gold thread 金缕玉衣. 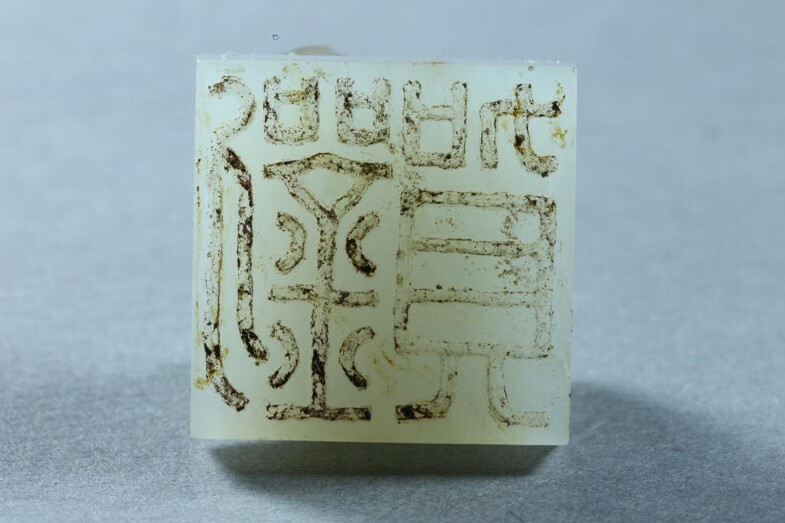 Therefore, although there are abundant grave goods and some gestures toward the status of being a king and an emperor, Liu He was still buried according to the scale of a marquis (Bai 2016). 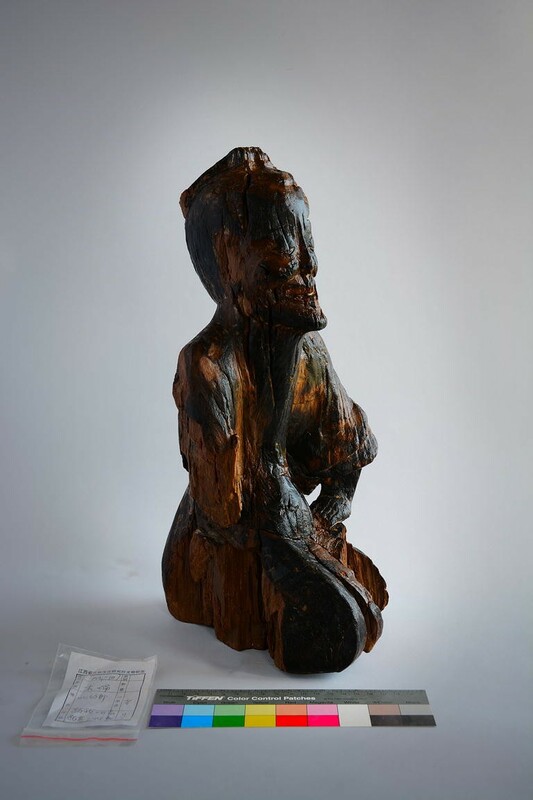 The archaeological discoveries give witness to both Liu He’s legendary life and the powerlessness of his peculiar rise and fall (Xin 2016). This paper was originally presented as a lecture in April, 2017, at the Tang Center for Early China at Columbia University (New York, USA). The contents were slightly revised and illustrations and notes were added for publication here. This paper was greatly assisted by Professor Li Feng 李峰 from the Department of East Asian Languages and Cultures at Columbia University. Dr. Wang Shihan 王诗涵 from the same department translated the paper into English. I would like to express to them my heartfelt thanks.